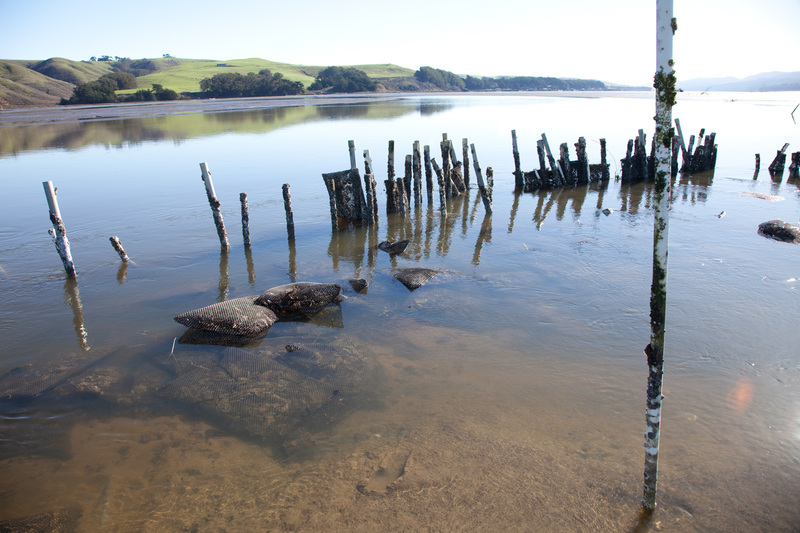 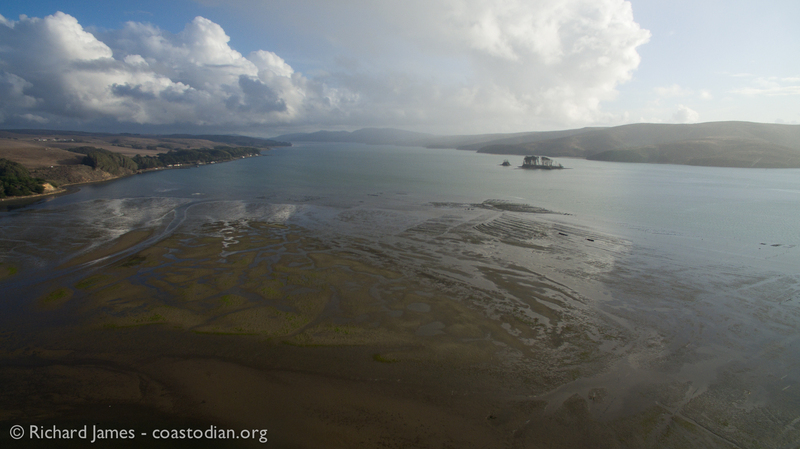 Yesterday I paid a visit to the mouth of Walker Creek where it enters Tomales Bay. 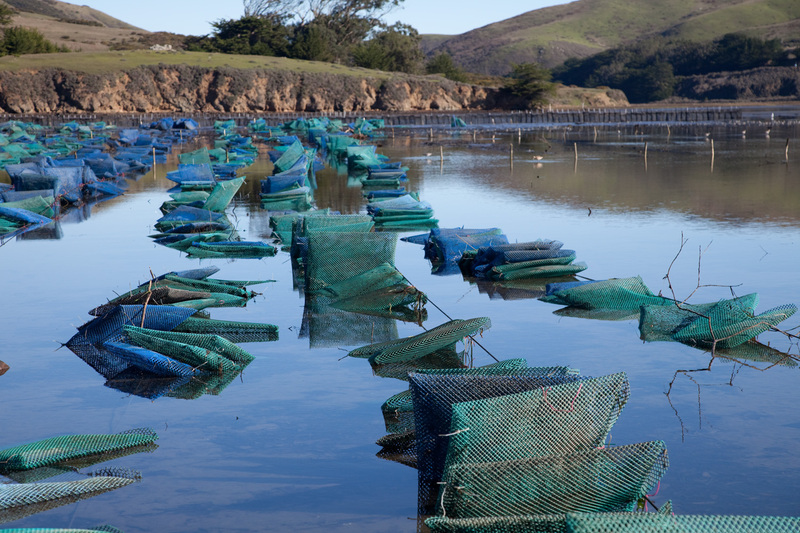 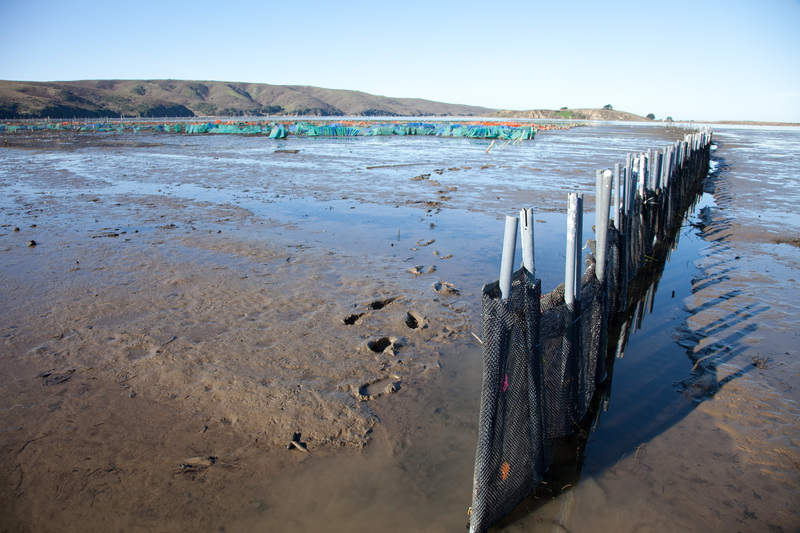 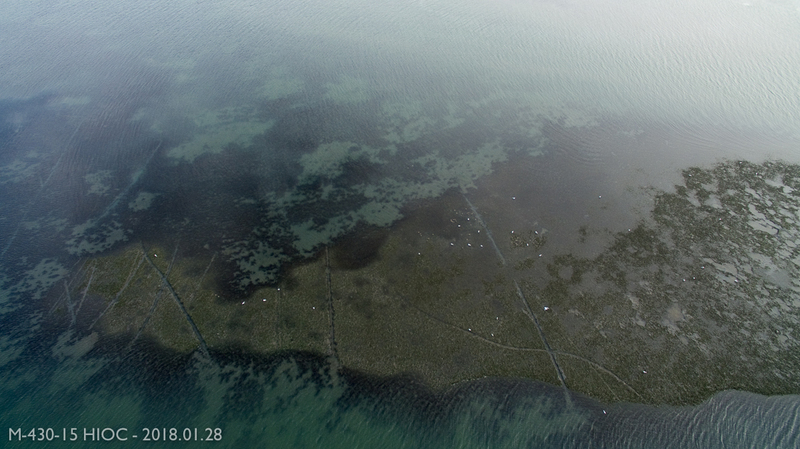 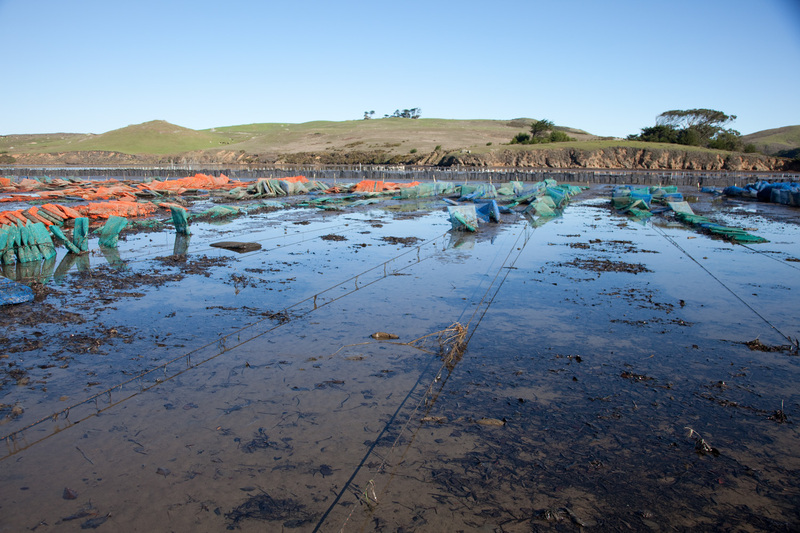 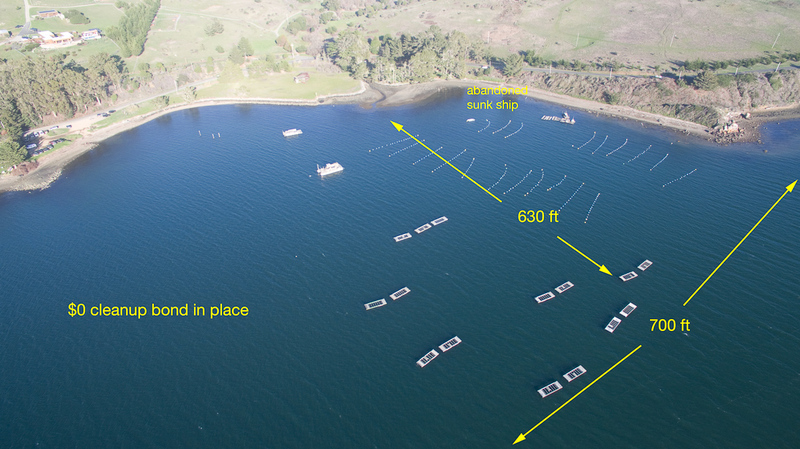 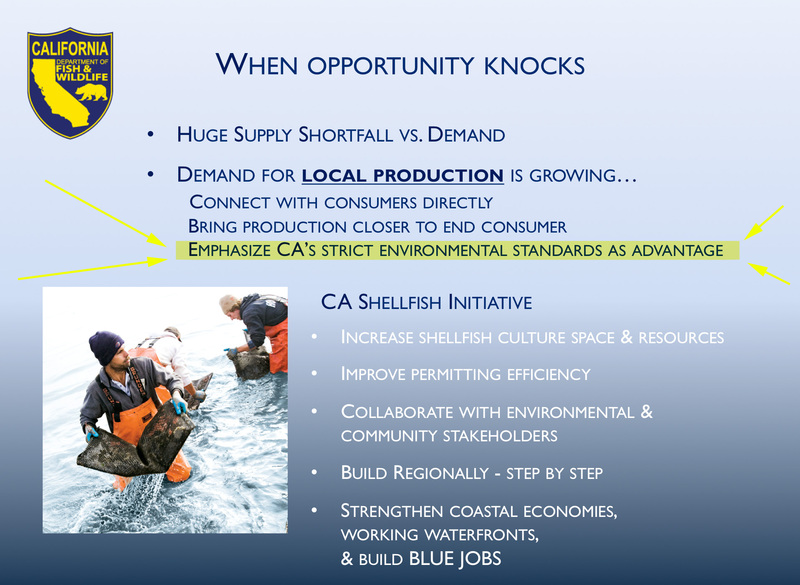 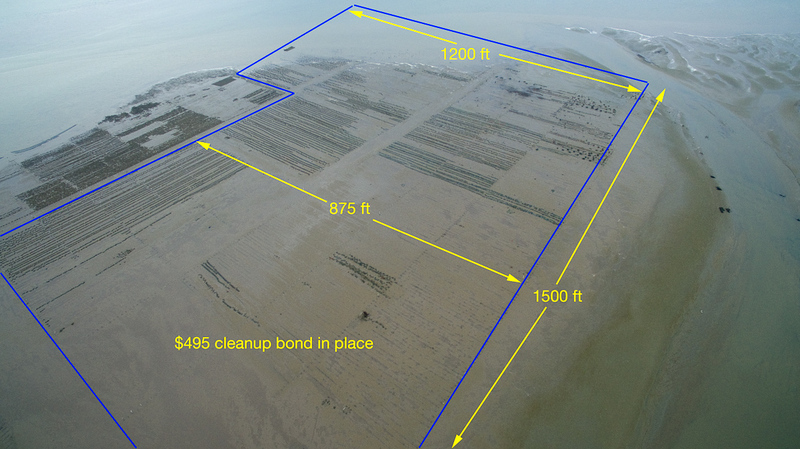 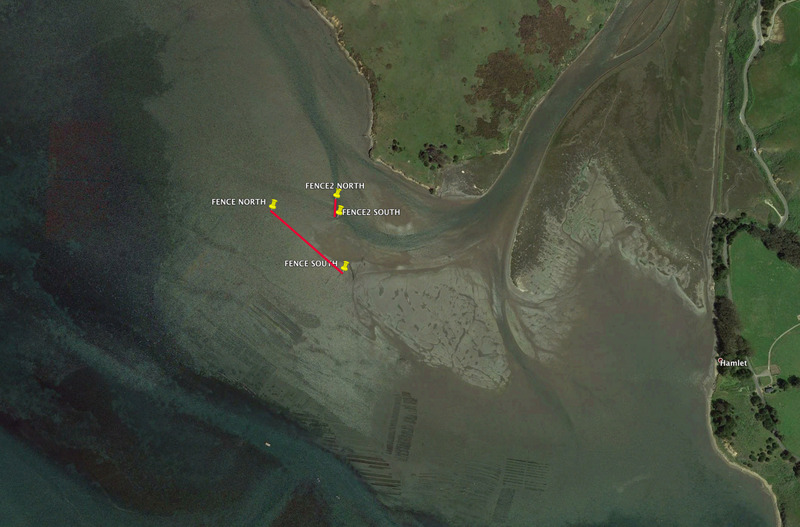 There are 4 growers that extract profits in the form of oysters in this area. 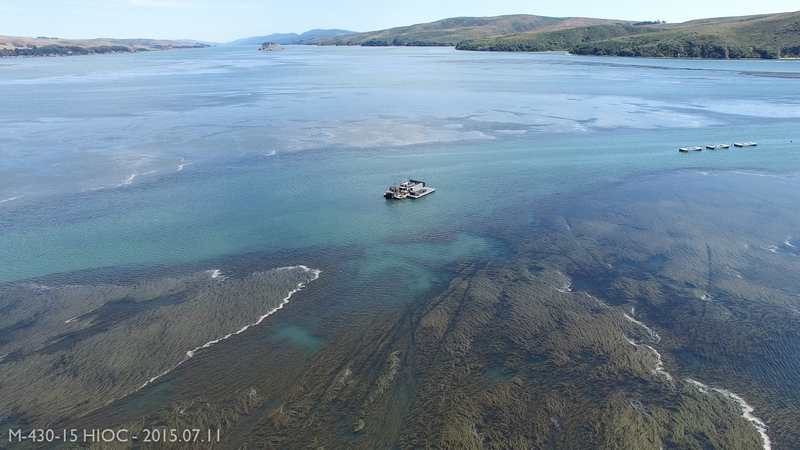 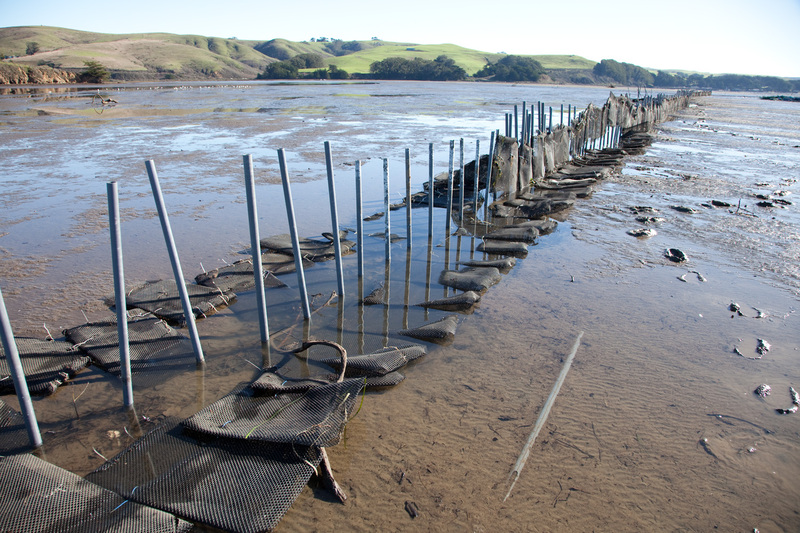 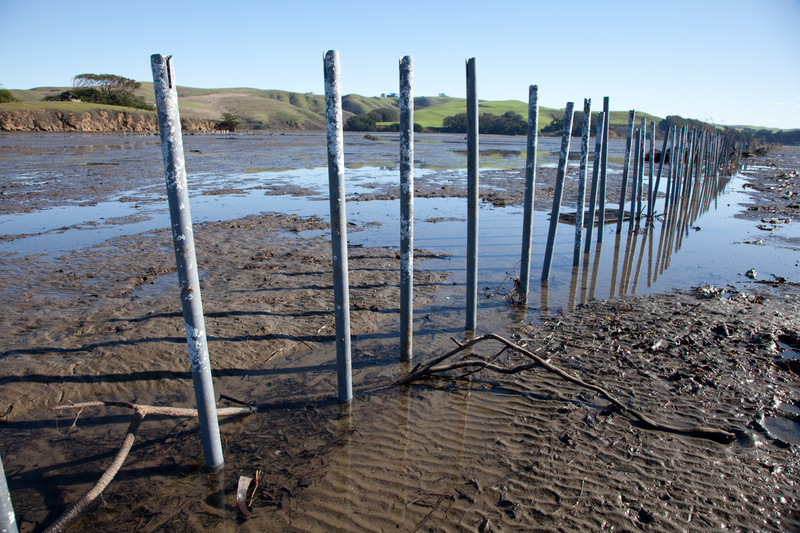 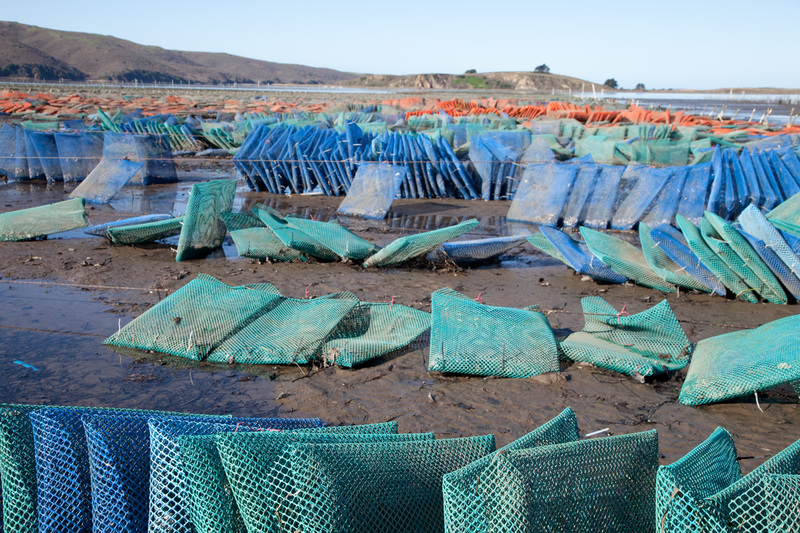 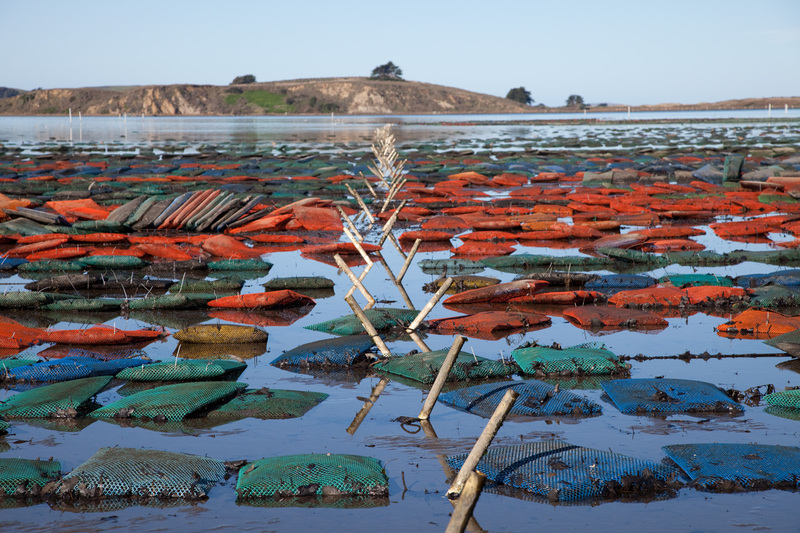 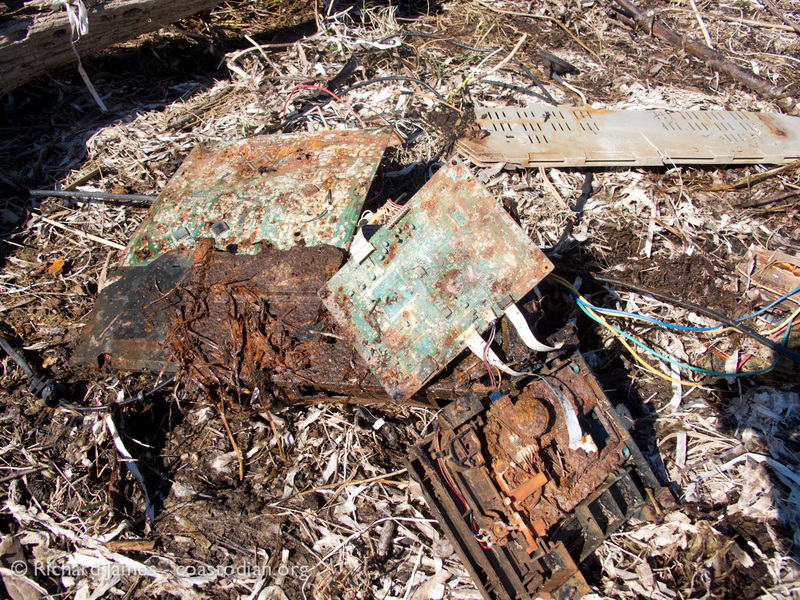 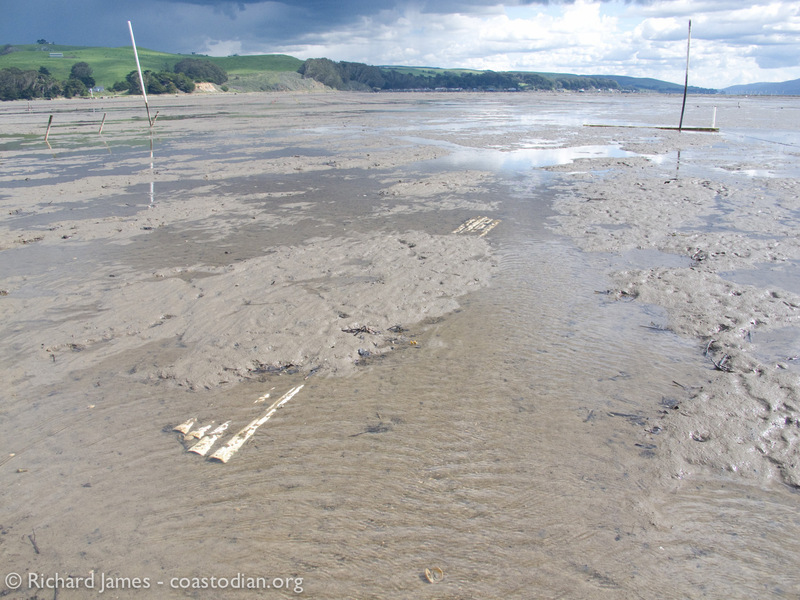 Storms regularly rip their equipment out and paint it all over Tomales Bay, and the entire ocean. 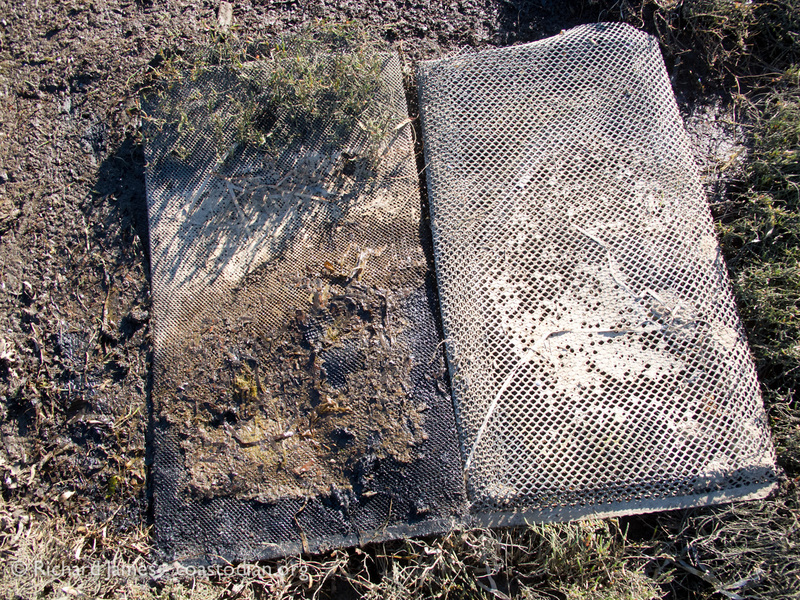 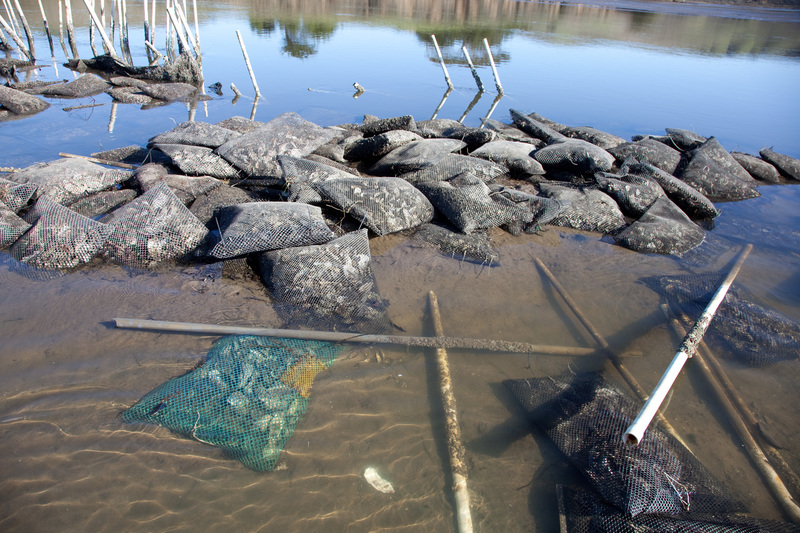 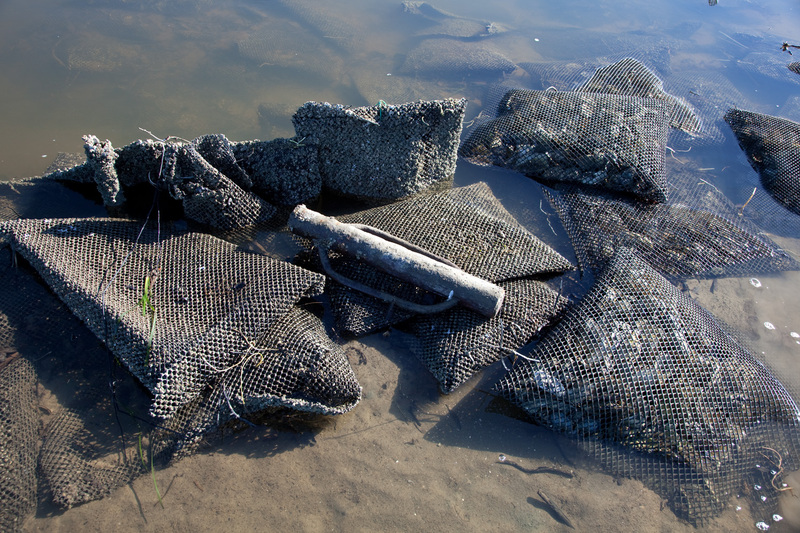 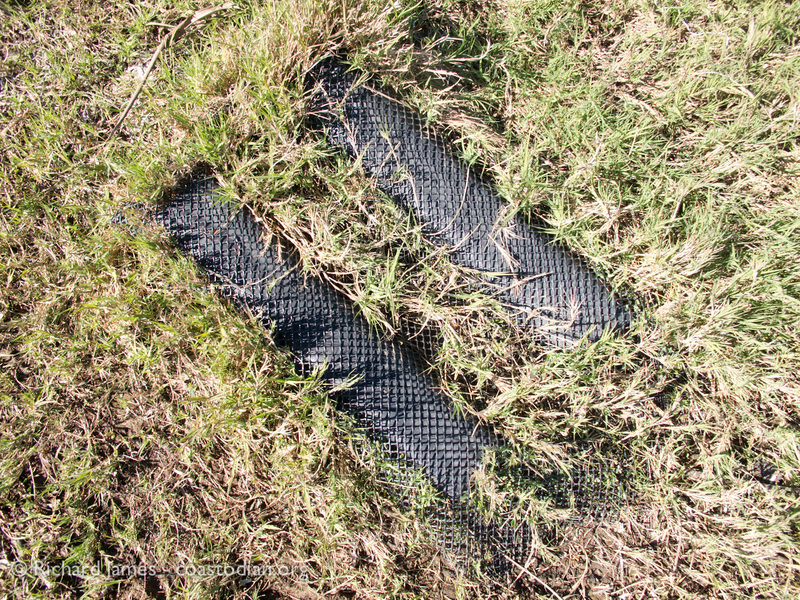 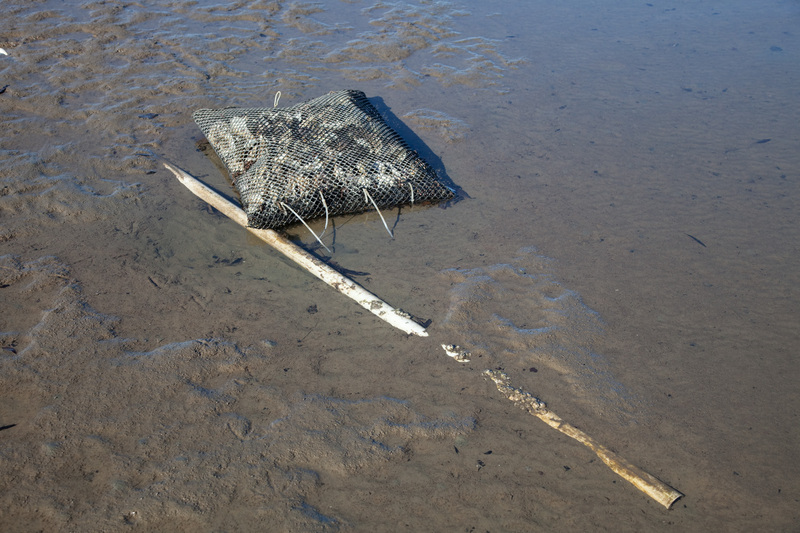 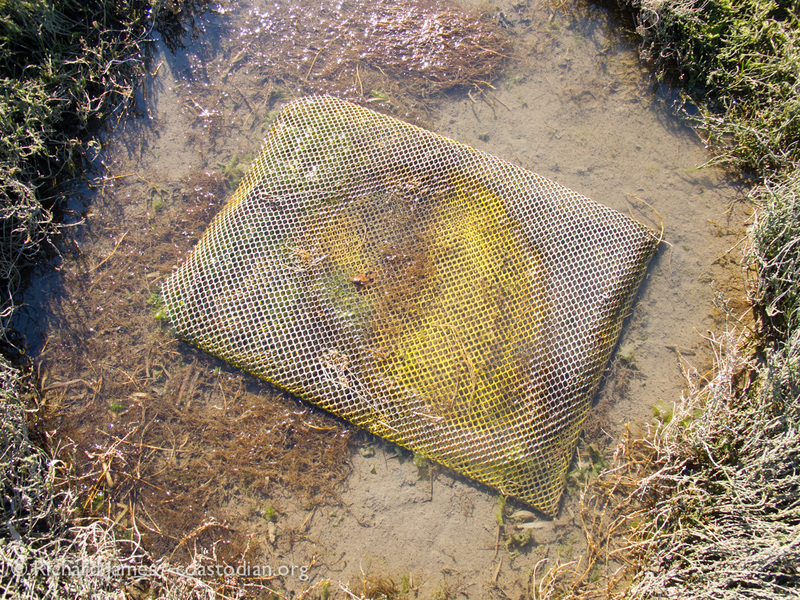 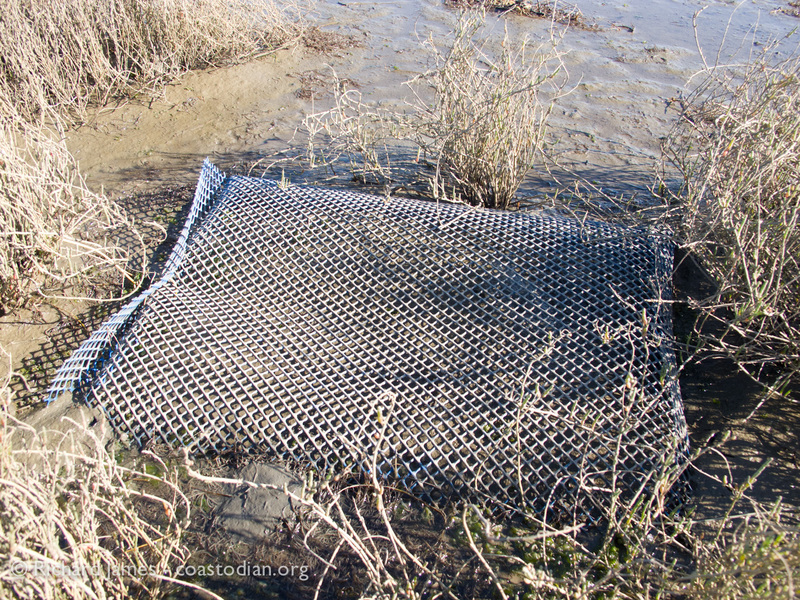 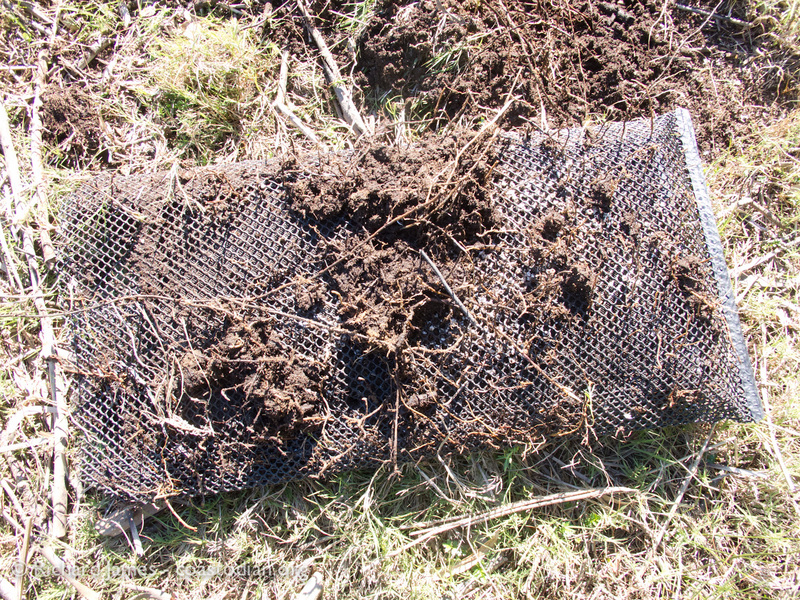 These bags become lodged in the mud and pickleweed and are buried, to be ground into plastic bits forever. 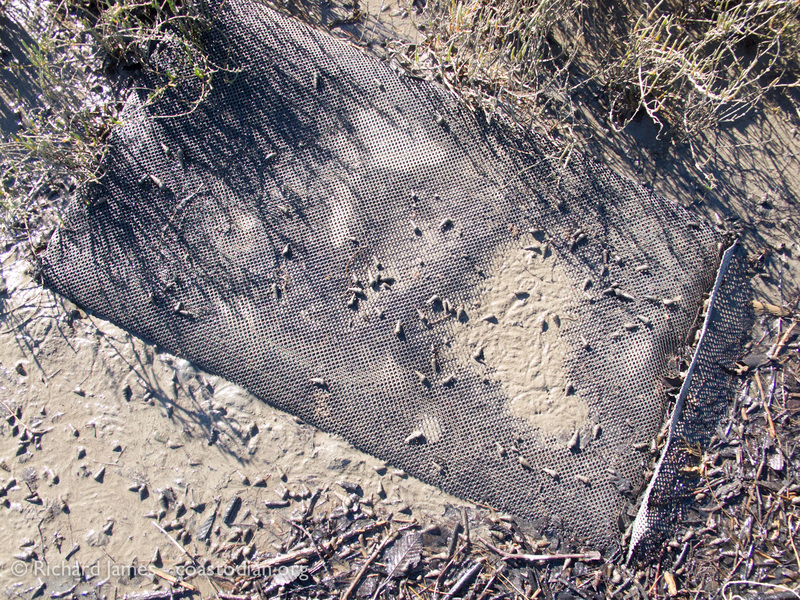 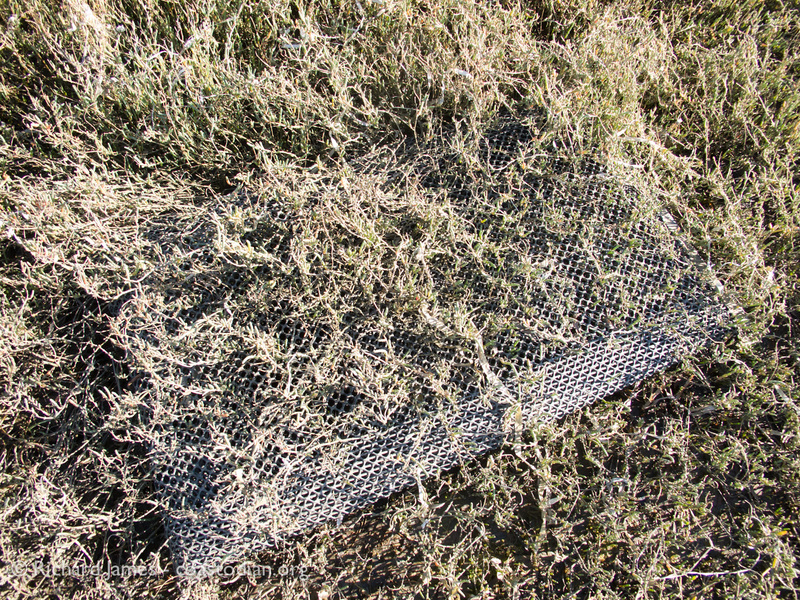 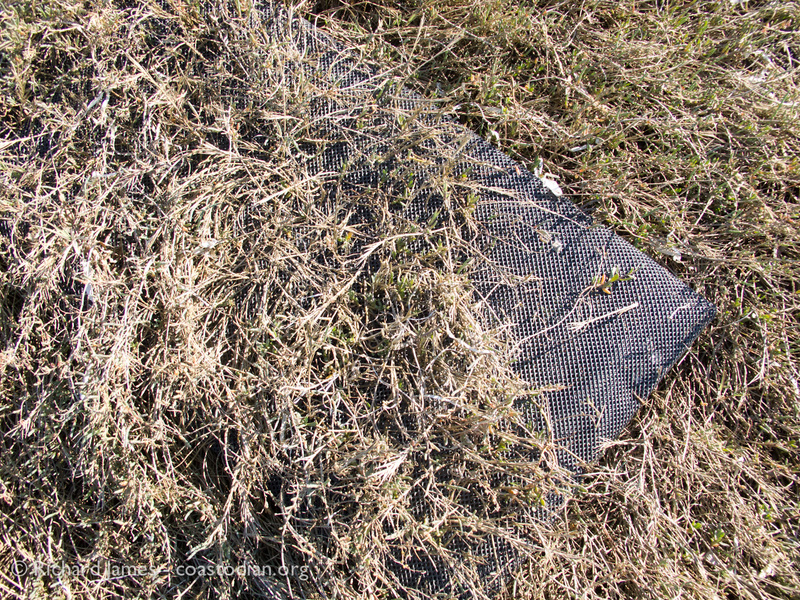 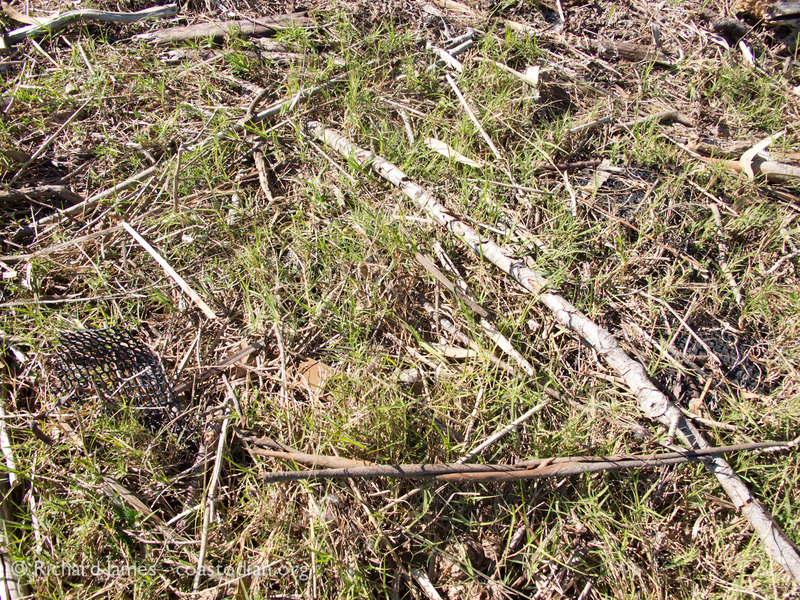 The farmers must walk these areas every month, if not more often, to ensure the mess they make gets cleaned up before being buried in the mud and pickleweed. 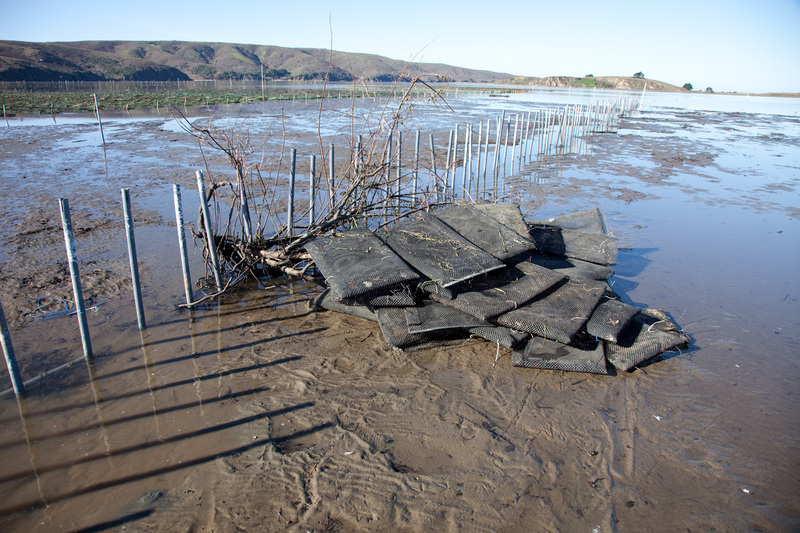 The regulating agencies must exercise their authority and ensure that laws are being observed, fining those that continue to break the laws enacted to protect the environment. 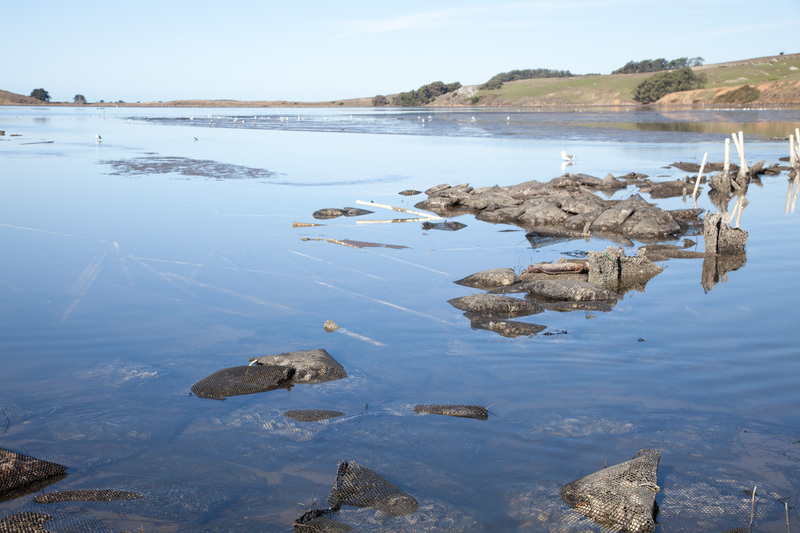 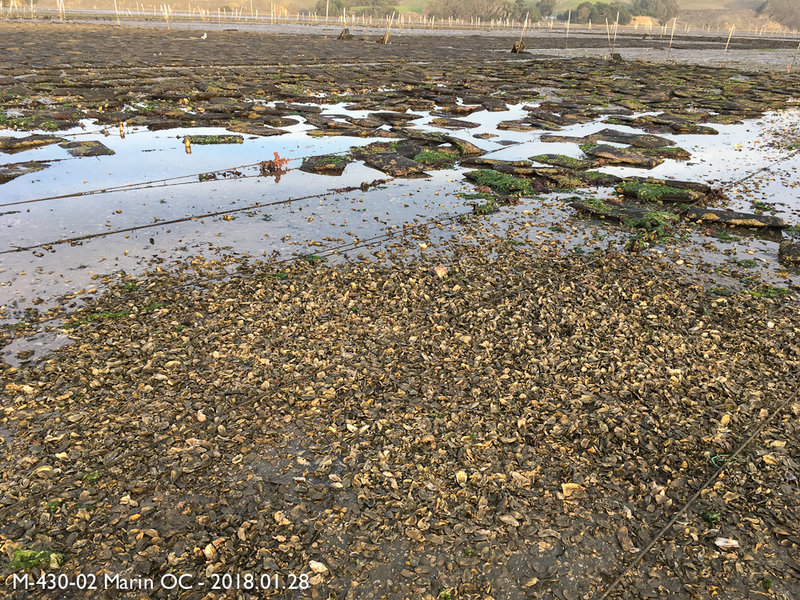 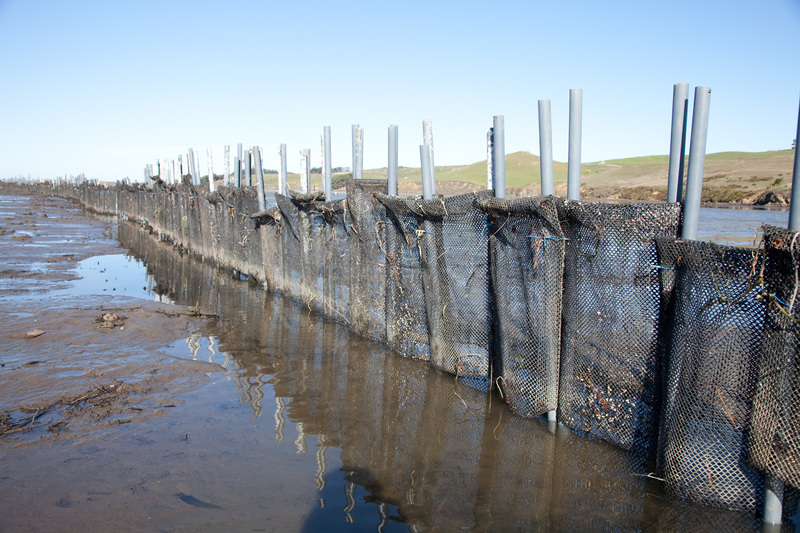 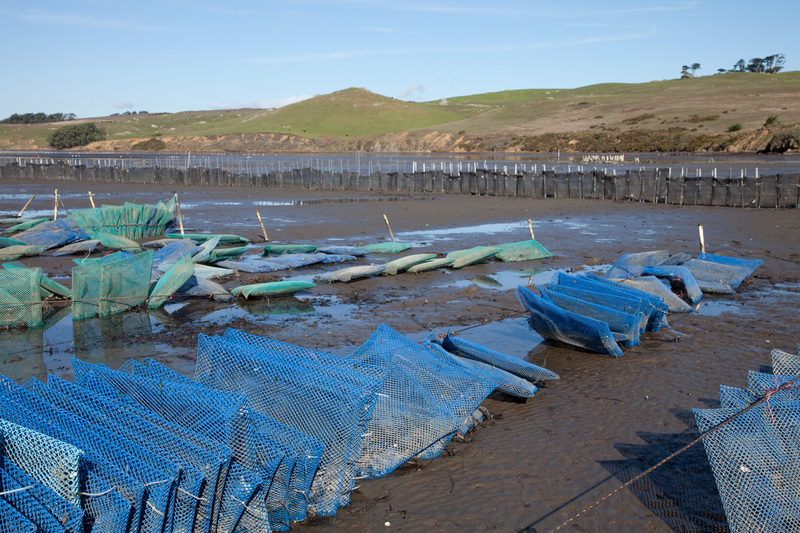 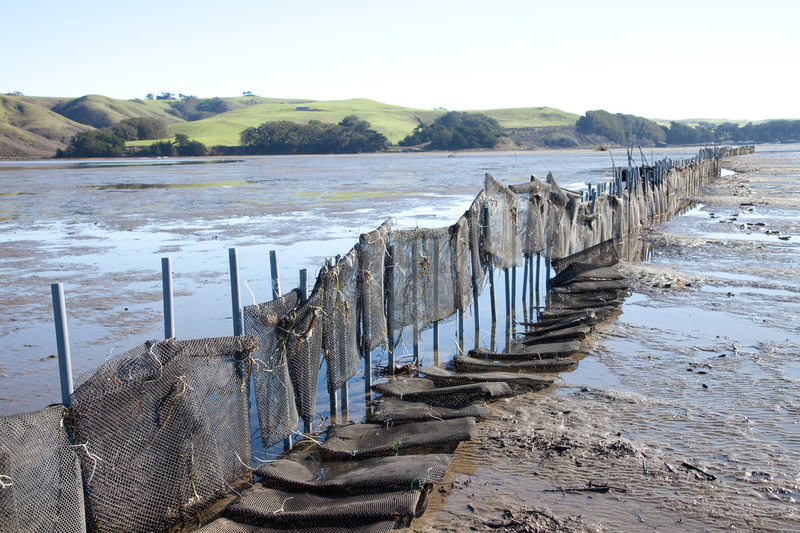 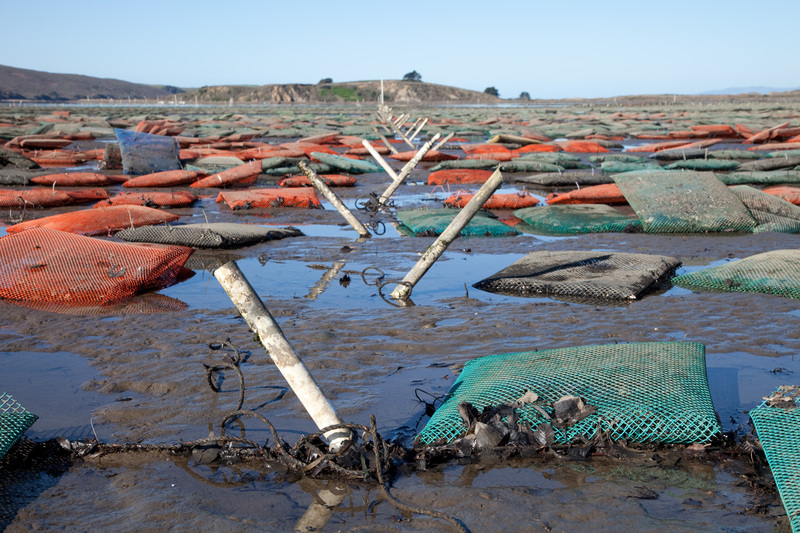 This post will be updated, so come back to see more of the damage caused to our fragile planet by oyster farming. 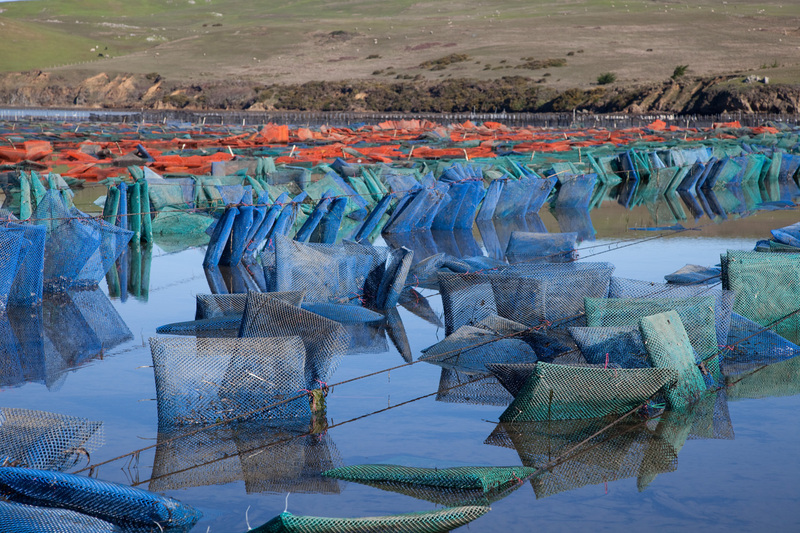 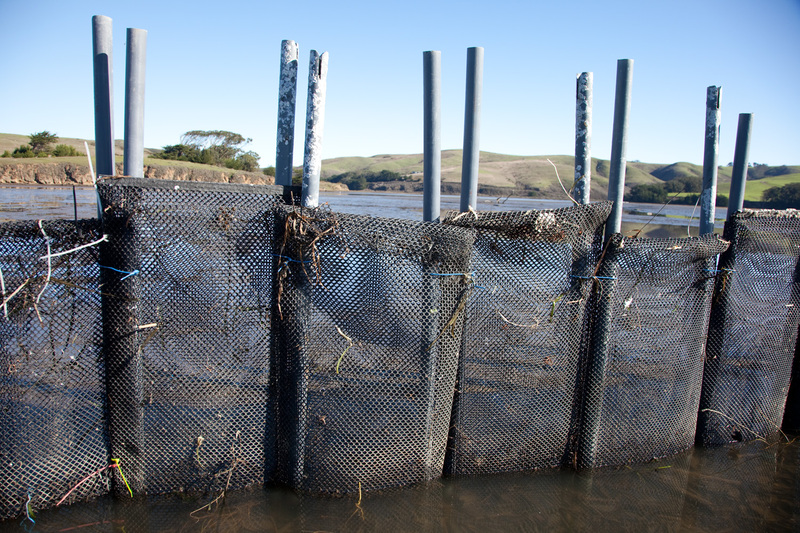 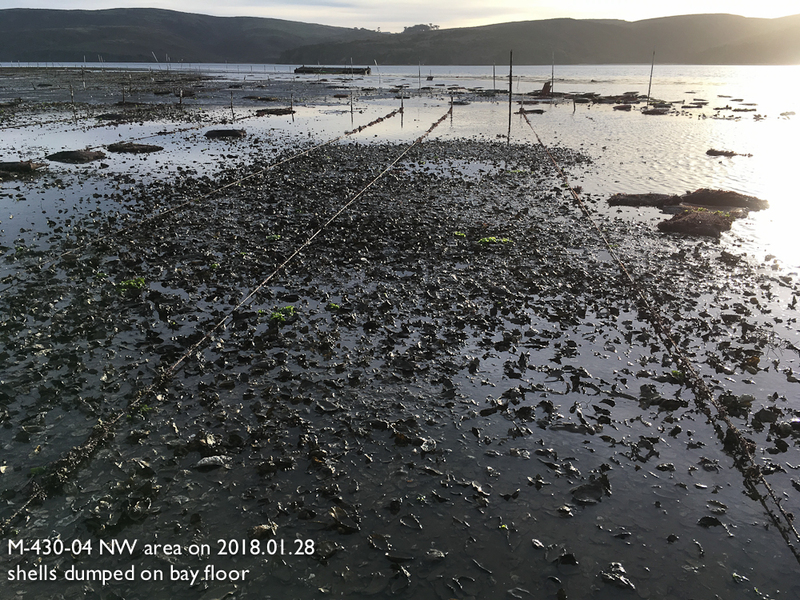 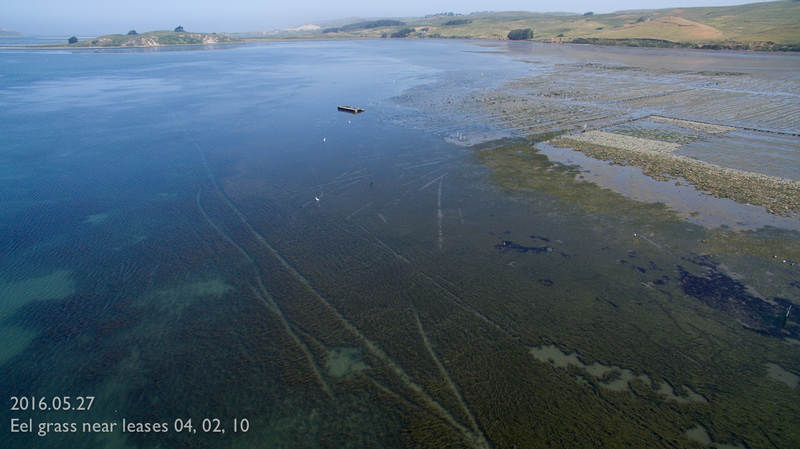 Click the words above “Save our Tomales Bay – part 18,…” to see this entire post. 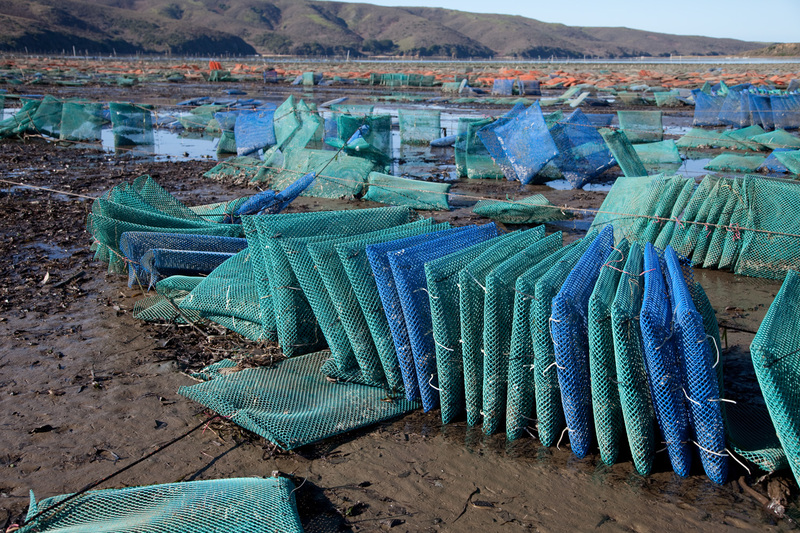 We’ve had some strong weather around these parts. 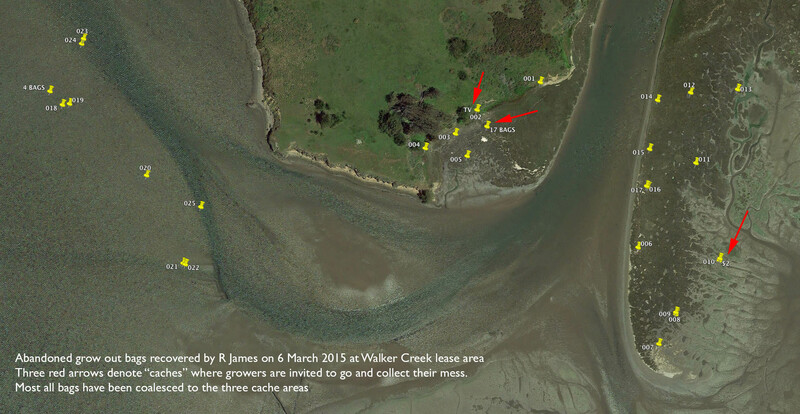 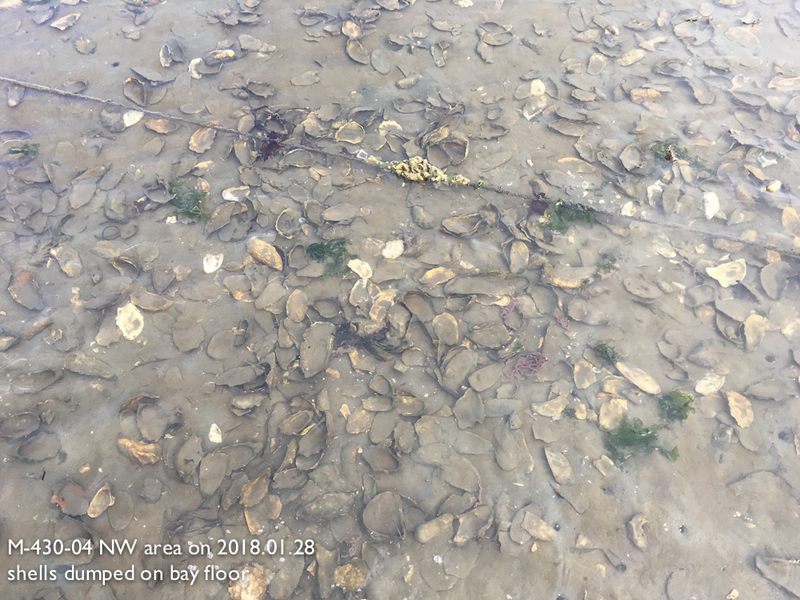 Witness the following images recorded today (29 Dec) showing the area at the mouth of Walker Creek. 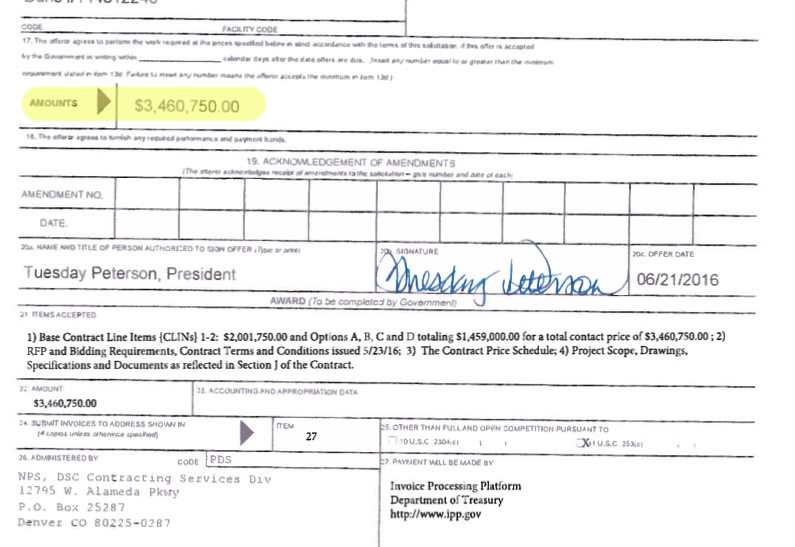 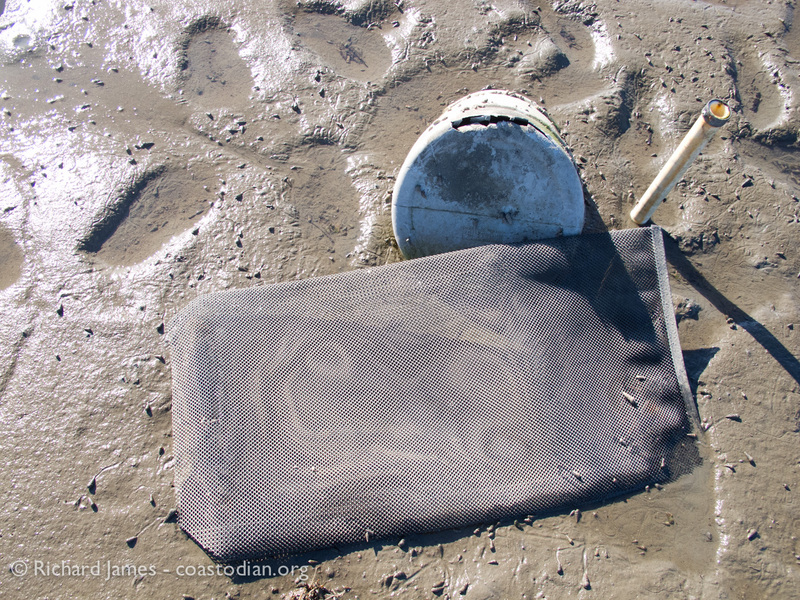 ©Richard James – coastodian.org – Here is one way to operate a lease…. 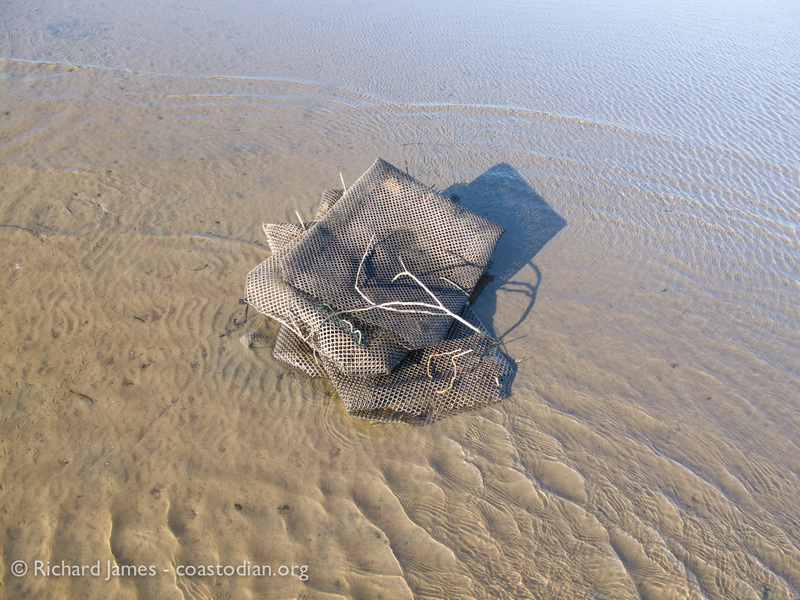 ©Richard James – coastodian.org – And here is another way…. 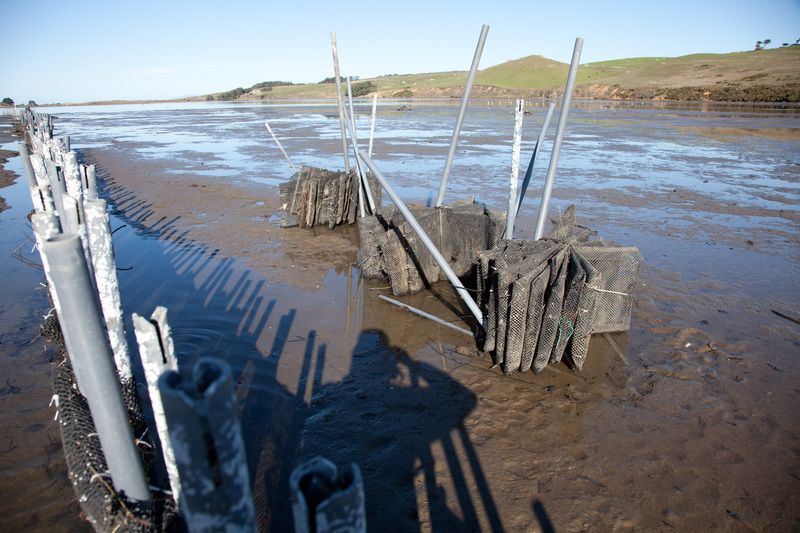 Seems some new construction has been going on in Tomales Bay. 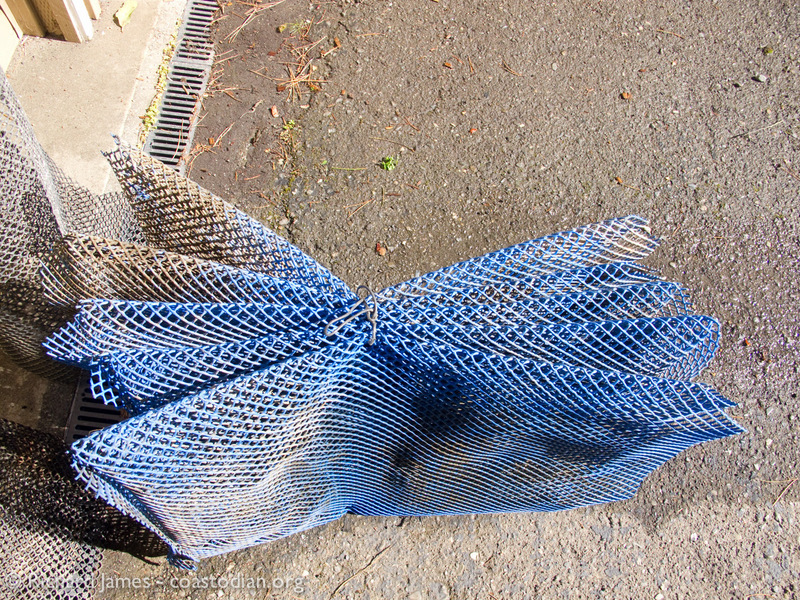 A fence, of sorts has sprung up. 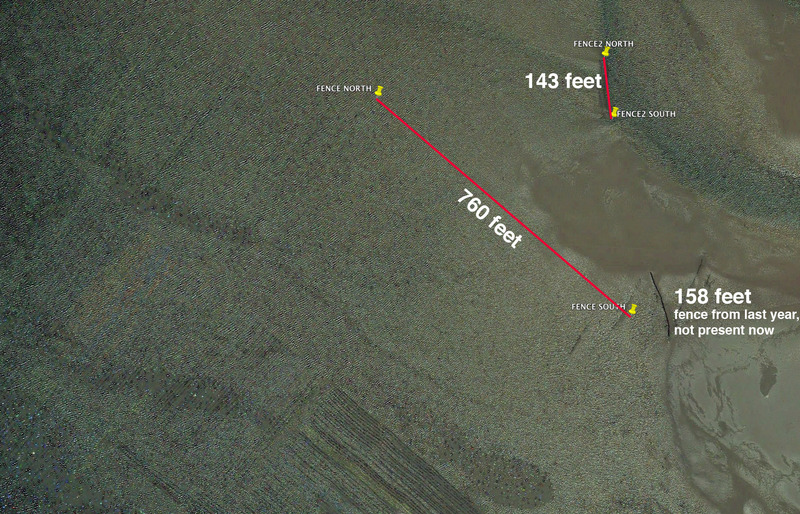 To get an idea where it is located, here are two images from Google Earth showing waypoints I marked when at this new structure. 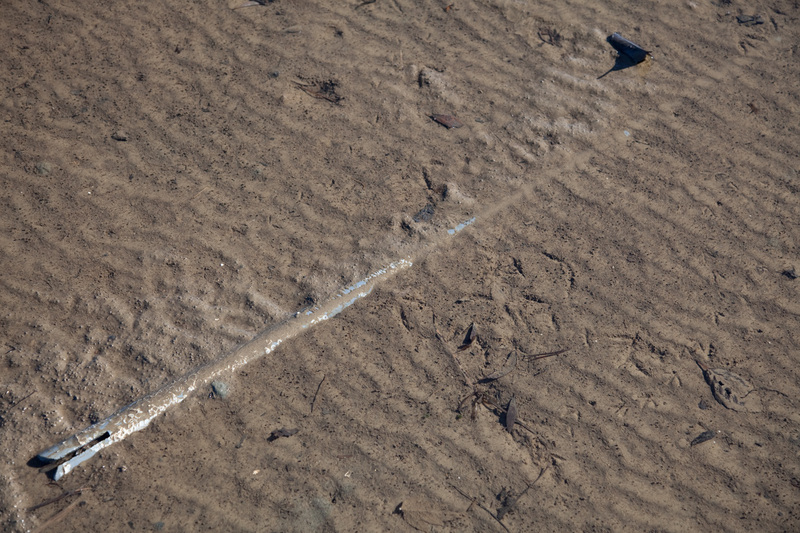 Here is a closeup version of the image above. 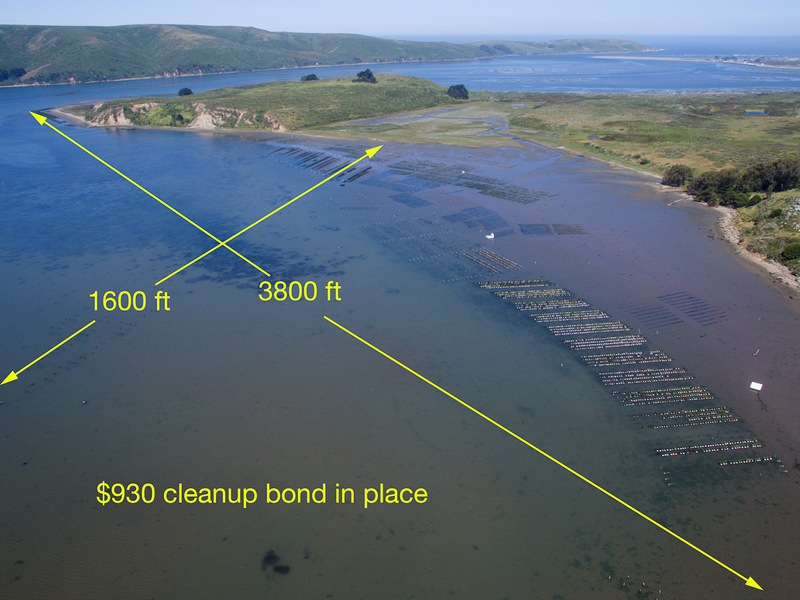 The red line shows where two “fences” are in Tomales Bay. 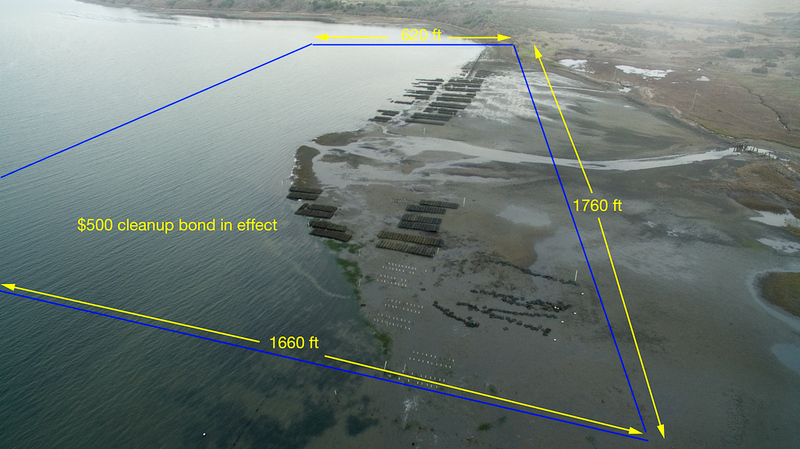 Note the length of these structures, as well as the length of a previous structure from last year that is no longer present, yet shown in the google earth image from last year. 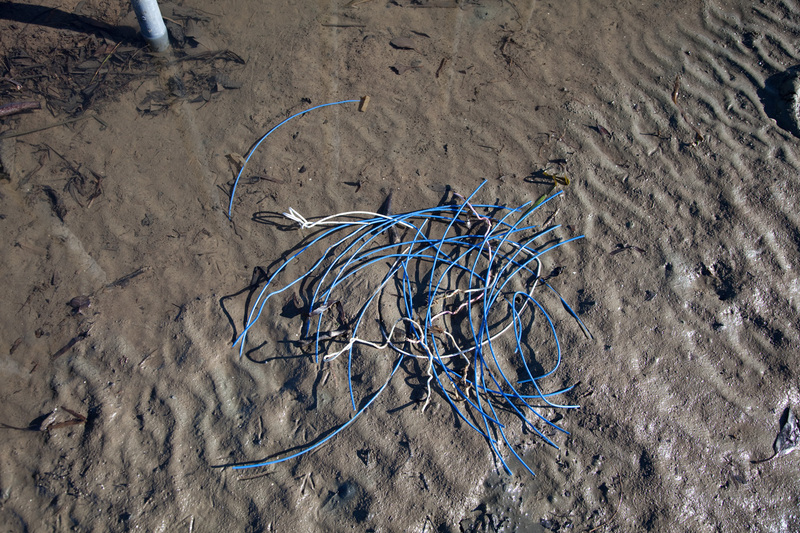 ©Richard James – coastodian.org – Plastic coated copper wire left as so much garbage….This sort of dis-respect of the very environment being capitalized upon really irks me. 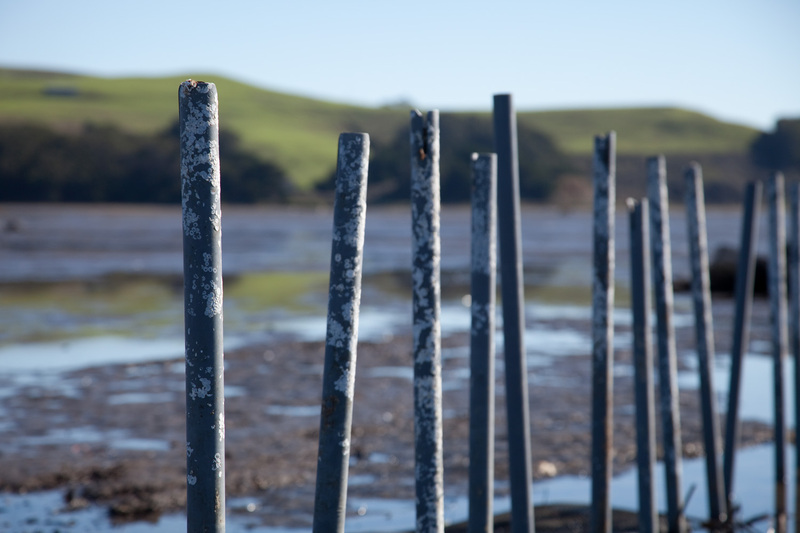 ©Richard James – coastodian.org – More tools of the trade left in Tomales Bay, as if it were the leaseholders’ garage and this were a hobby. 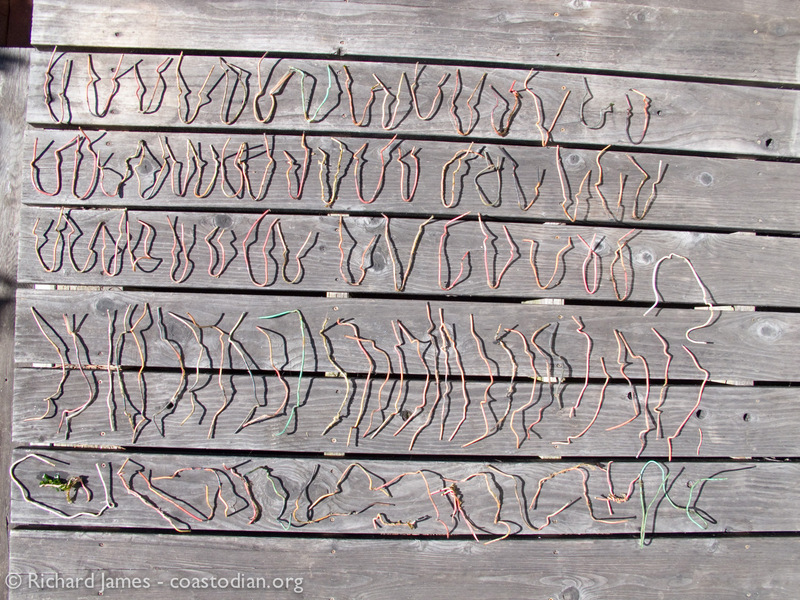 ©Richard James – coastodian.org – Ah what the heck, let’s just leave these here, nobody will notice. 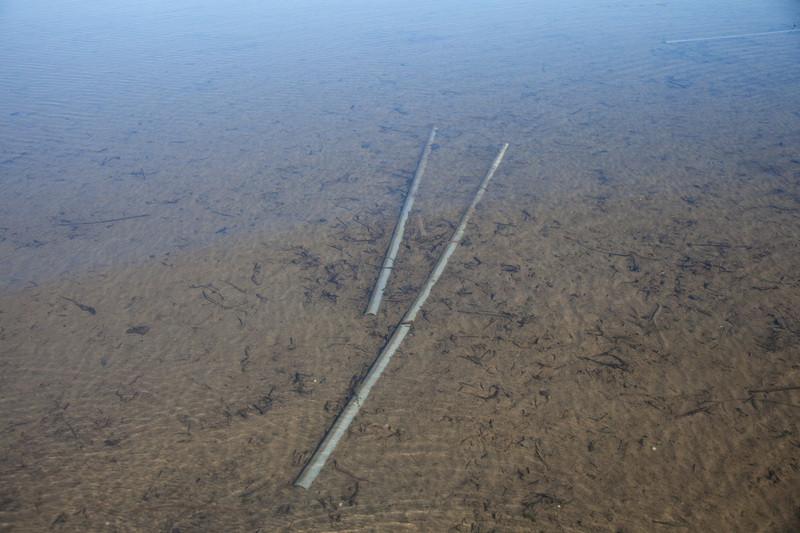 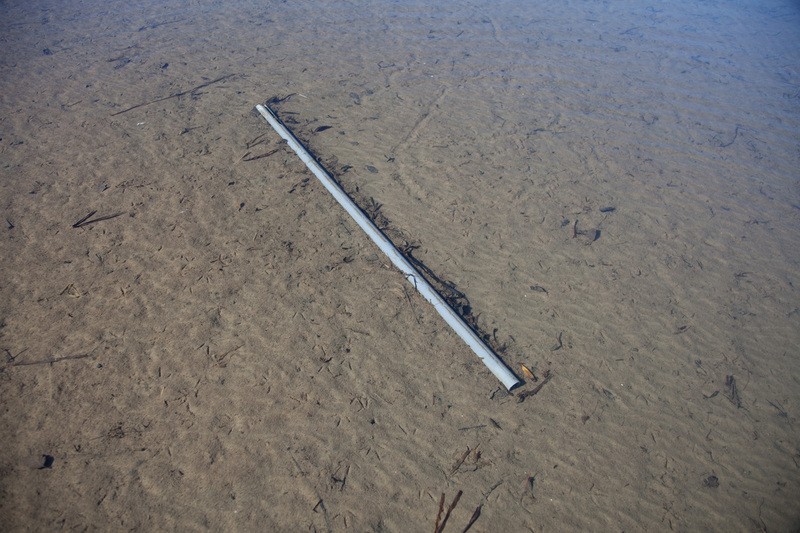 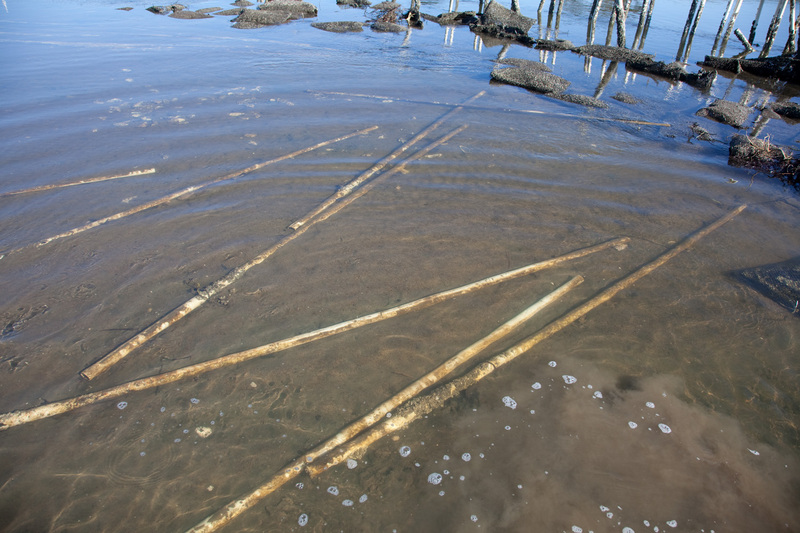 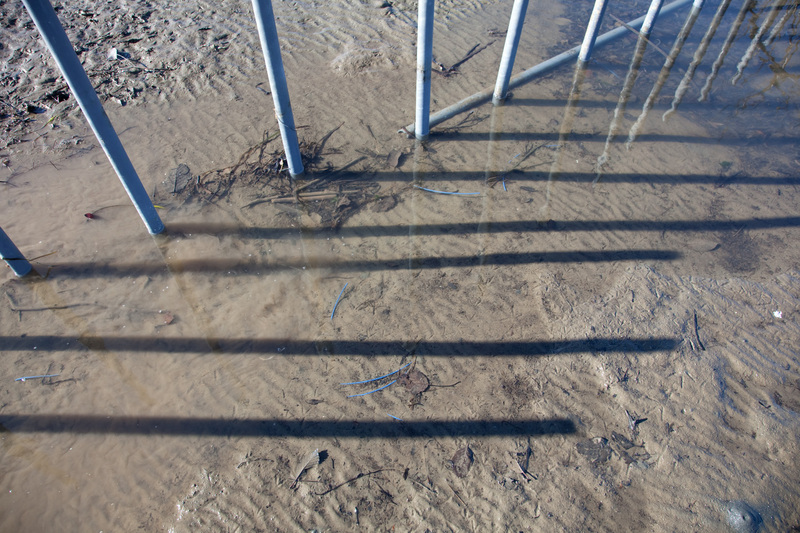 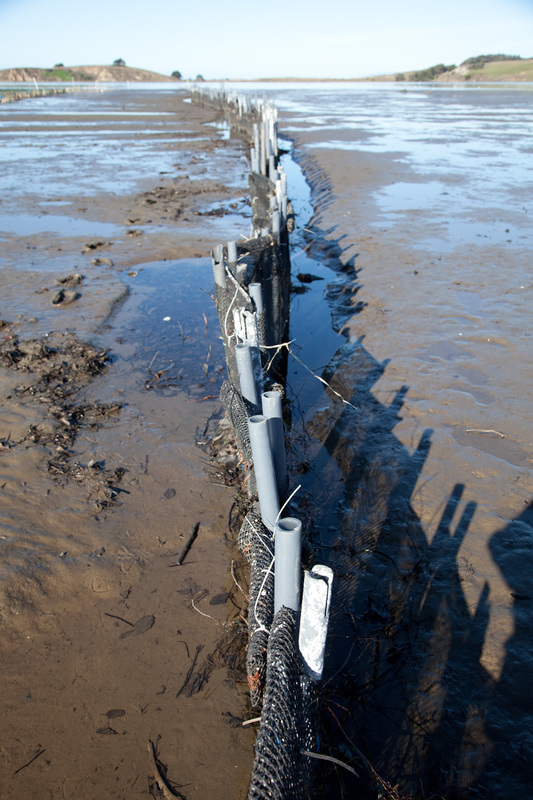 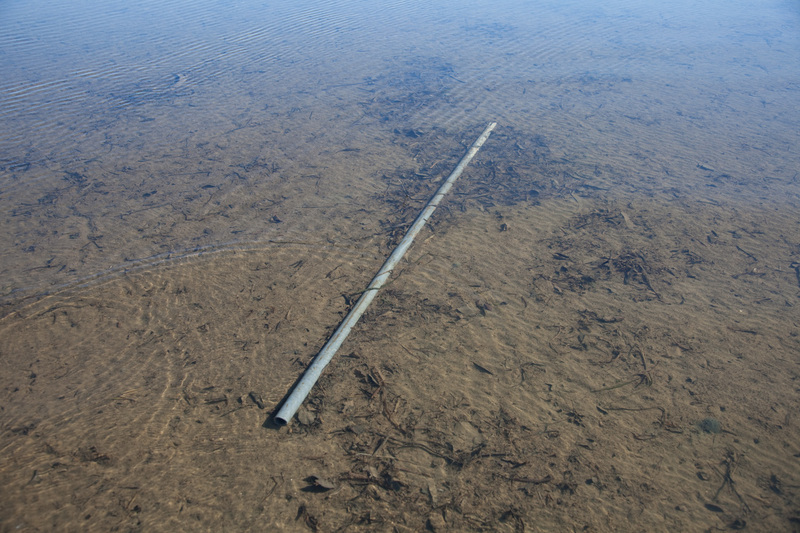 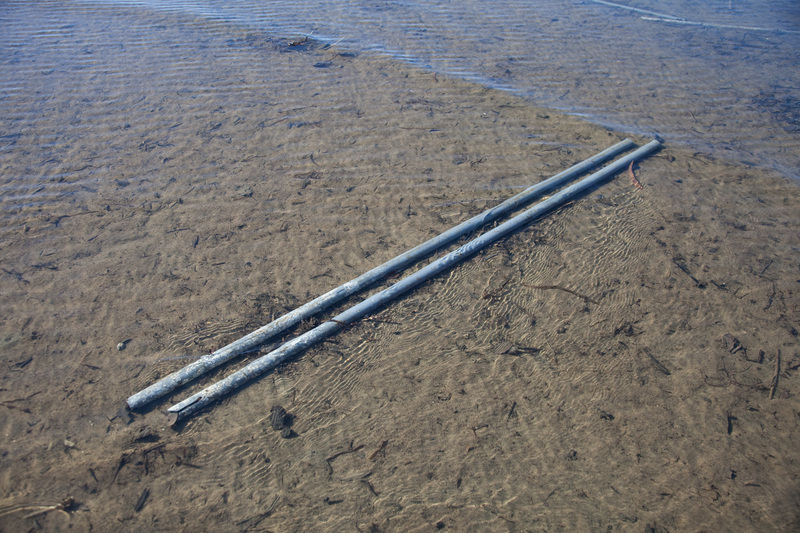 ©Richard James – coastodian.org – All of these PVC pipes you see are different pieces left to the sun and tides. 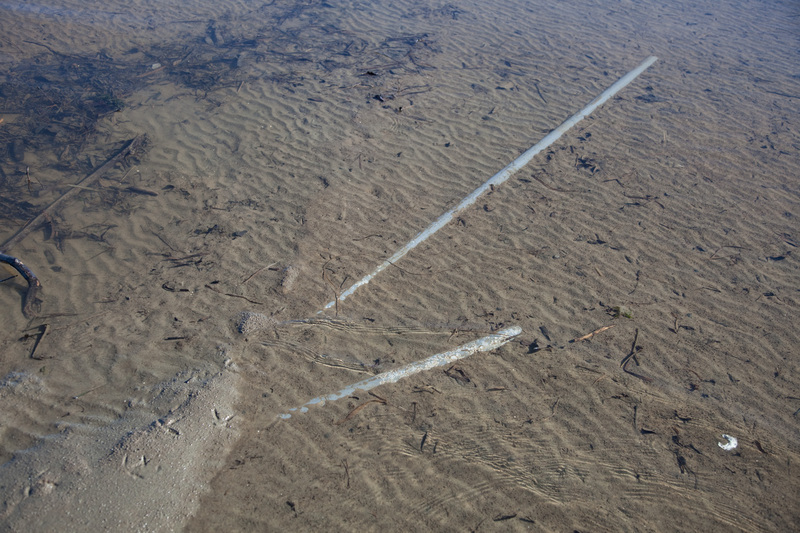 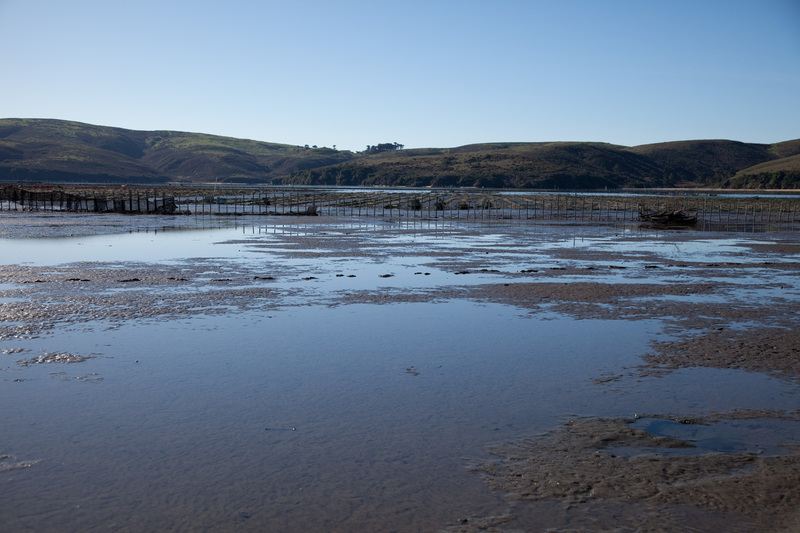 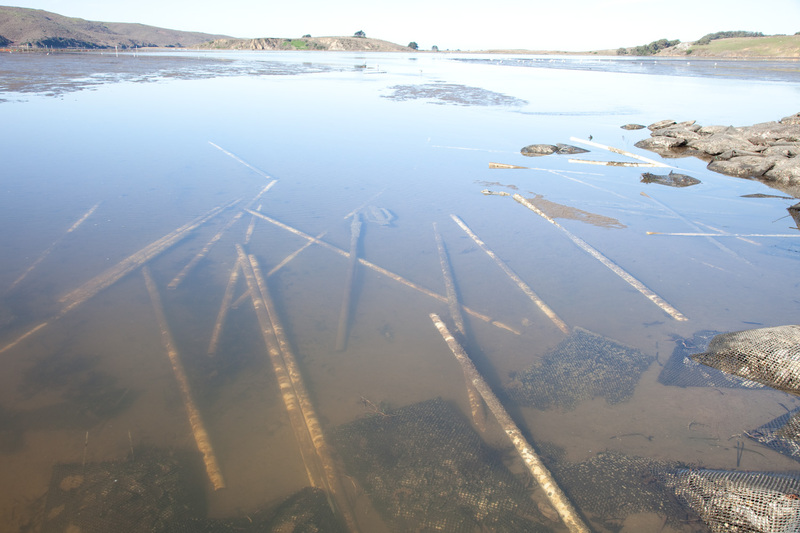 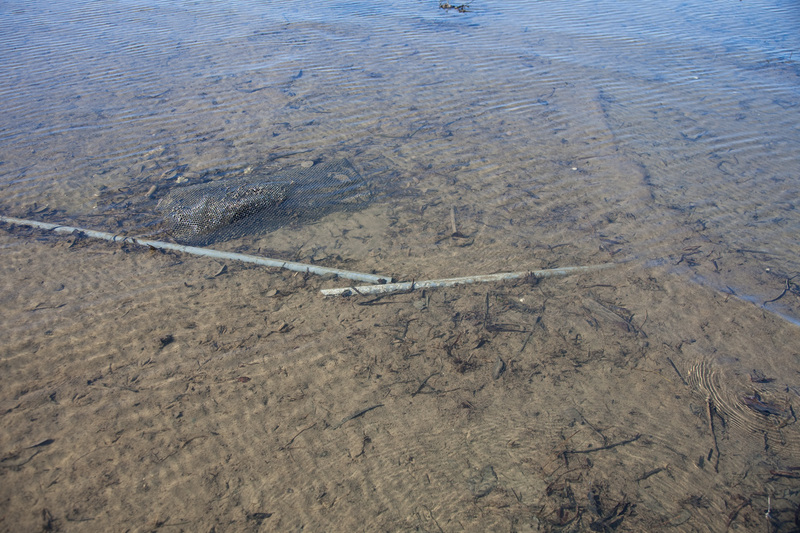 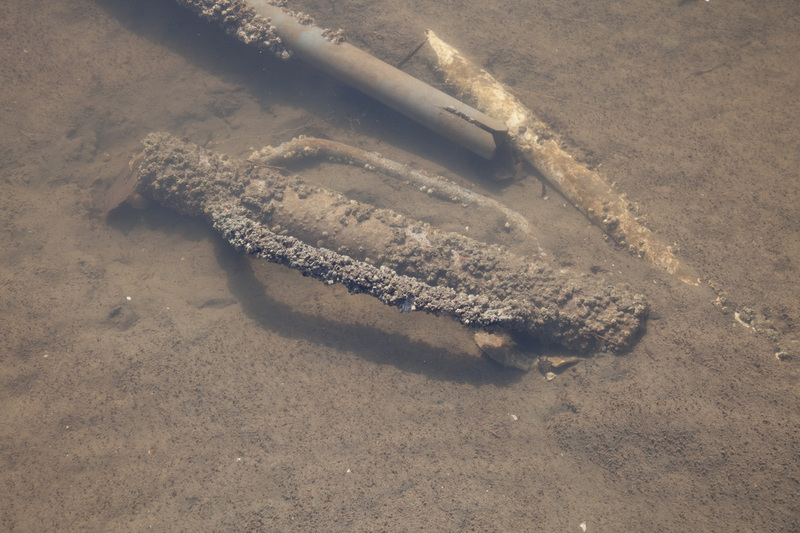 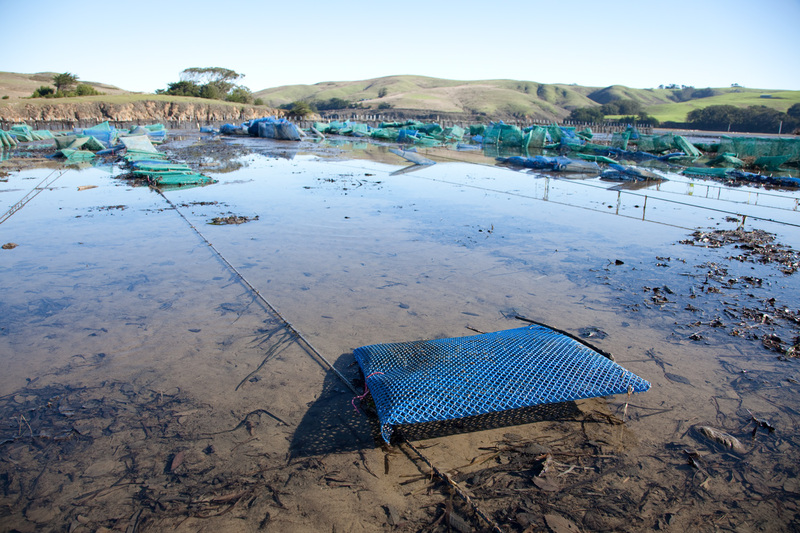 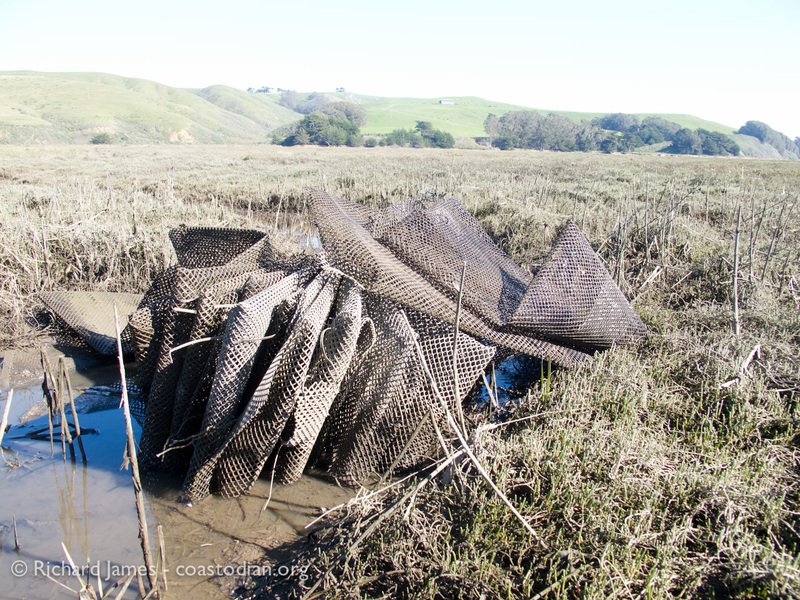 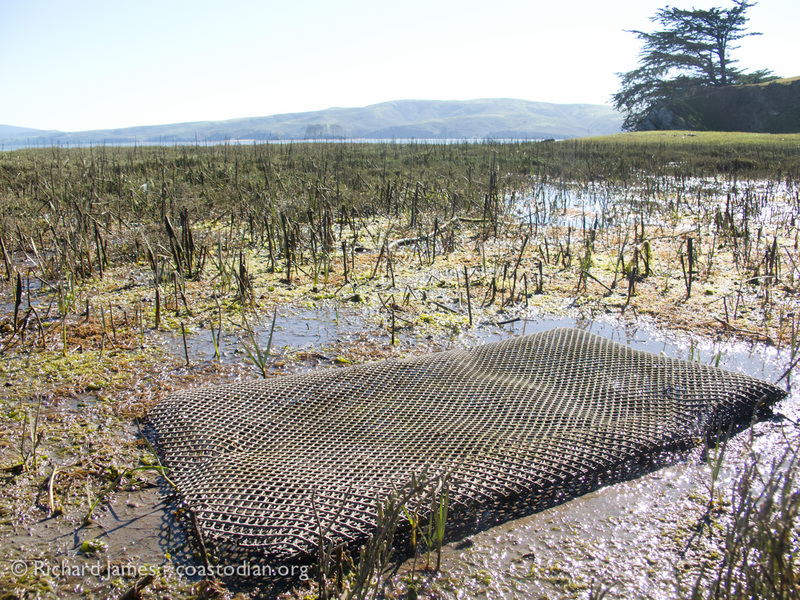 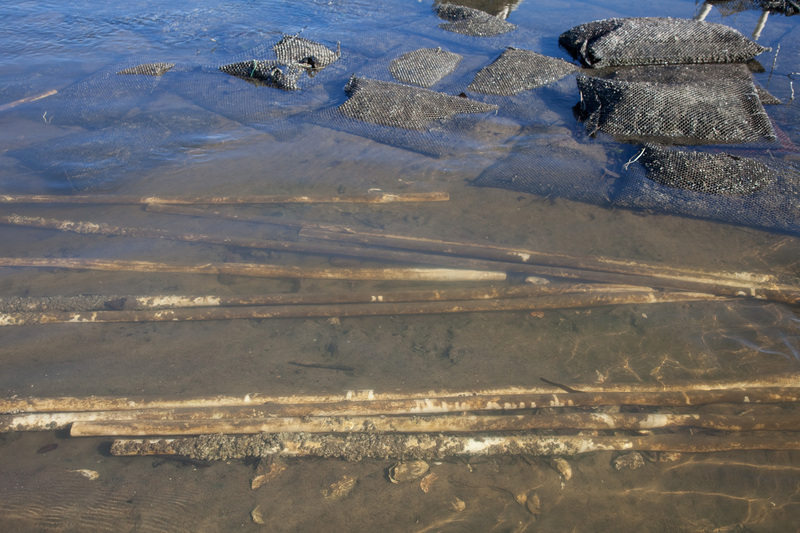 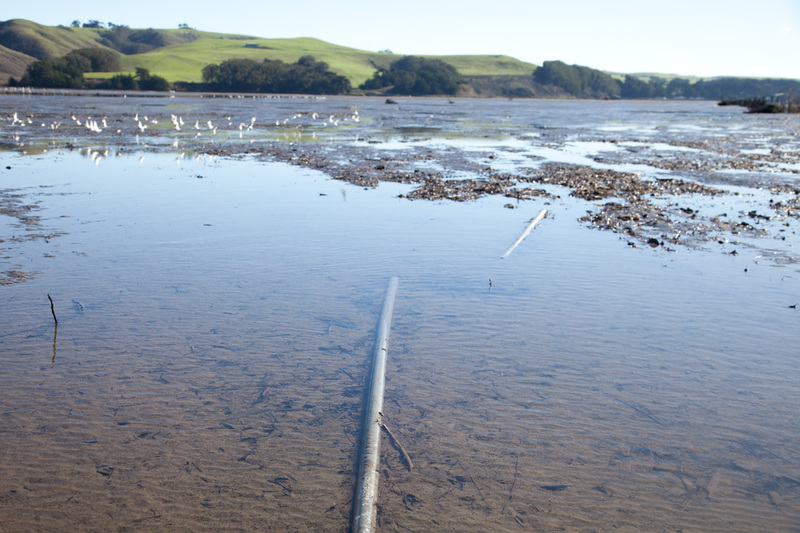 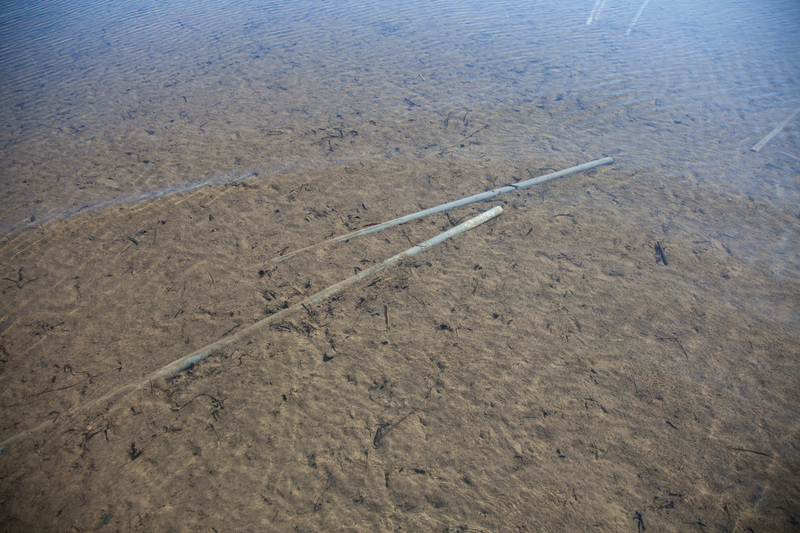 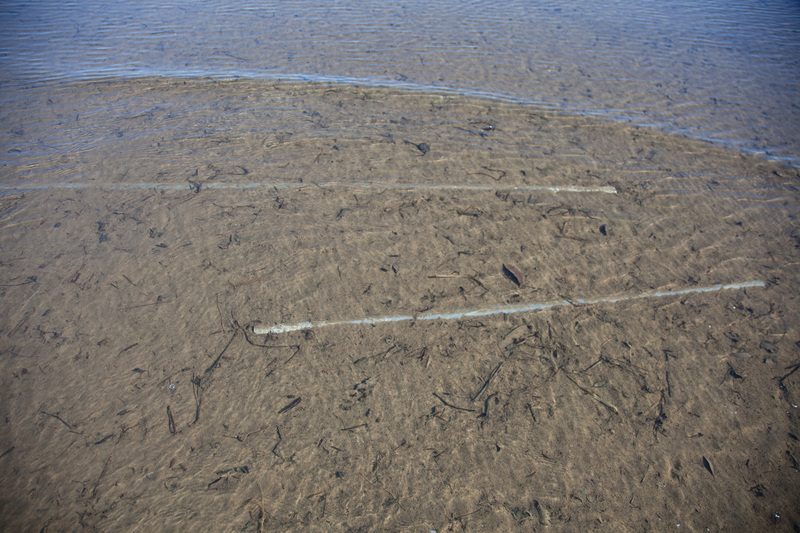 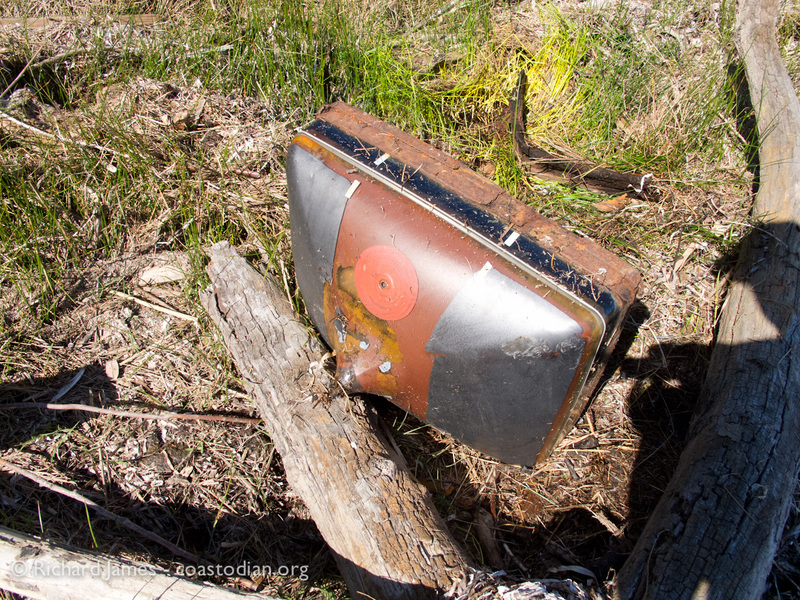 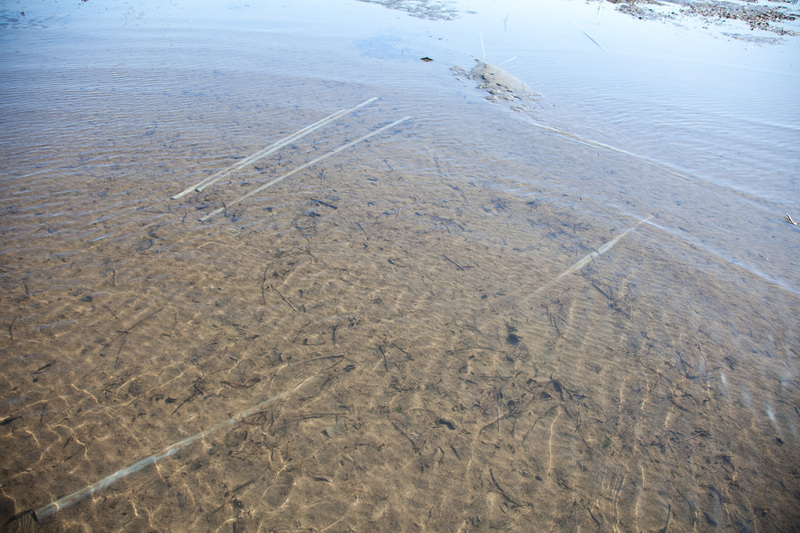 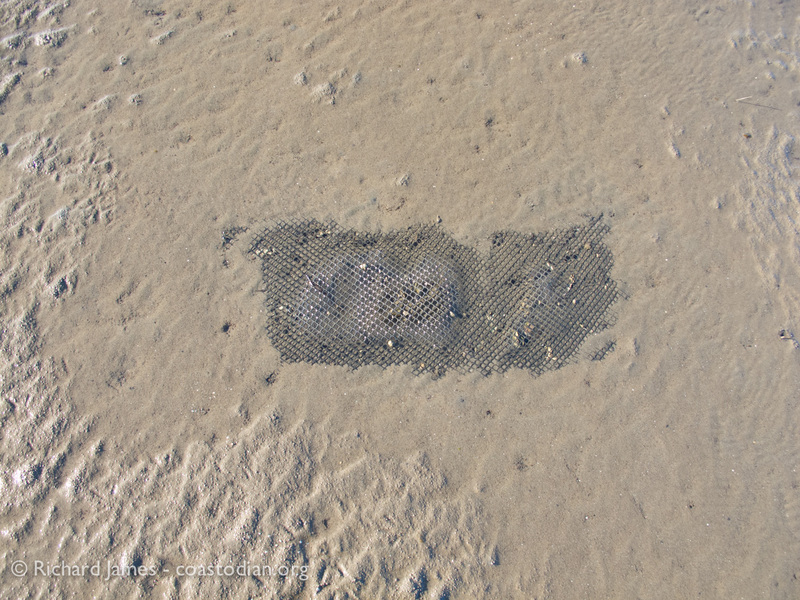 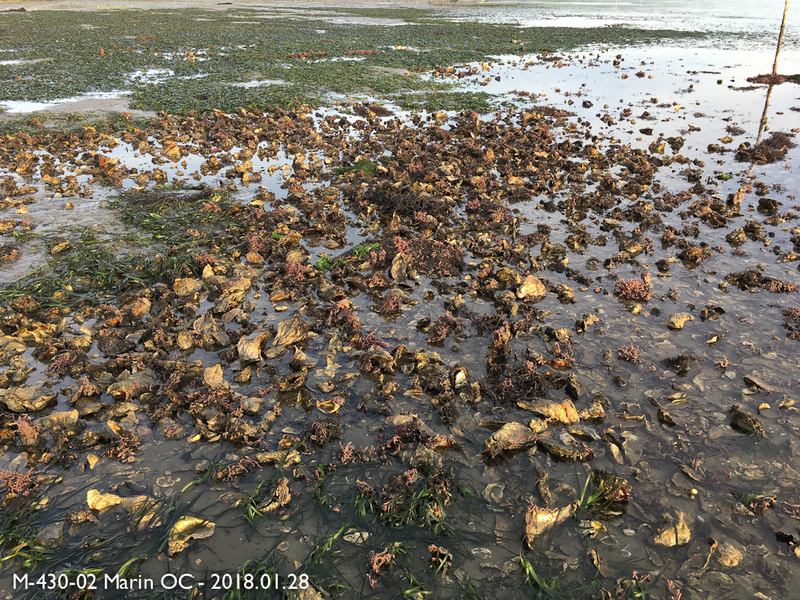 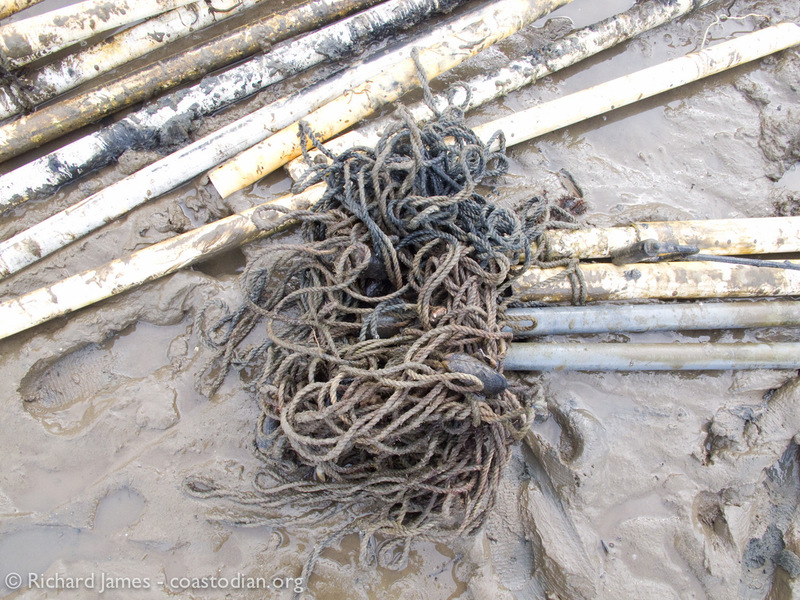 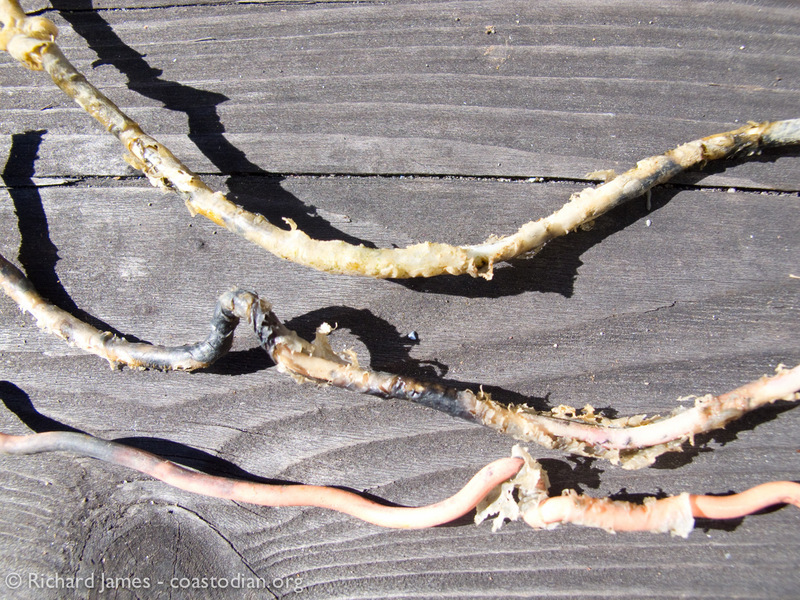 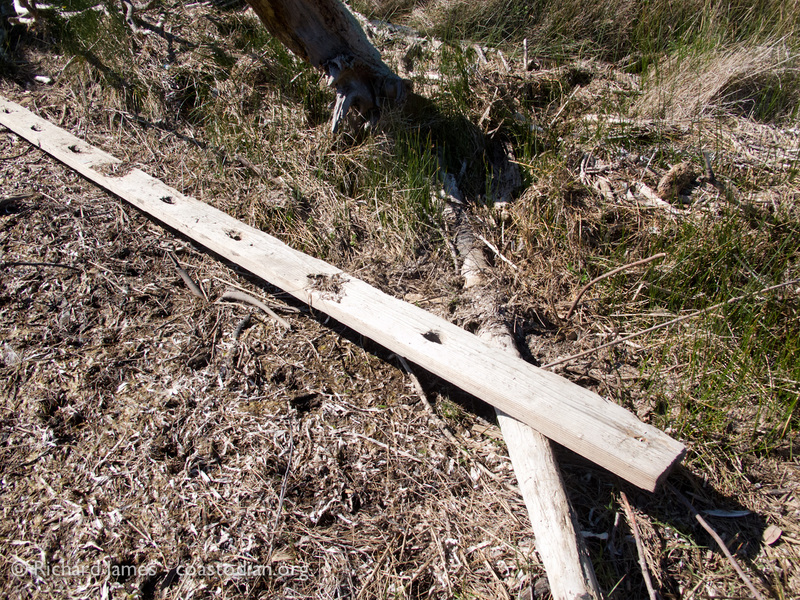 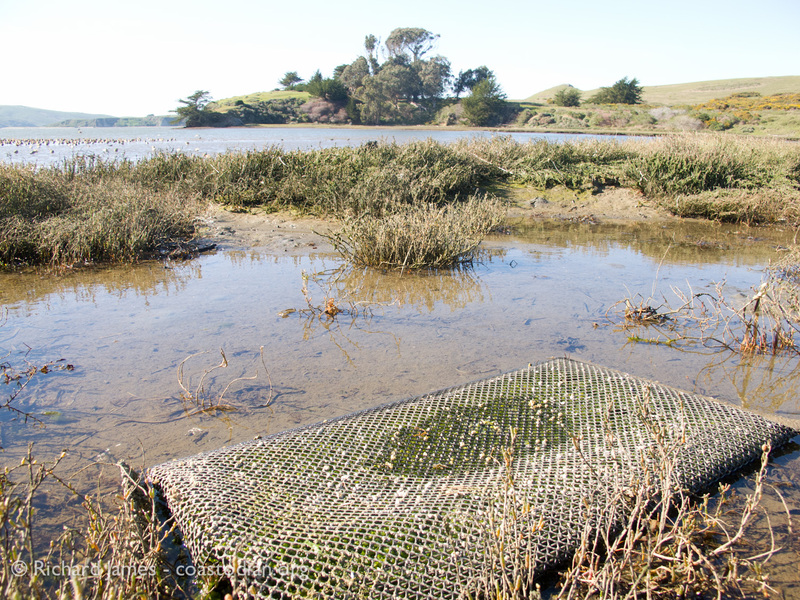 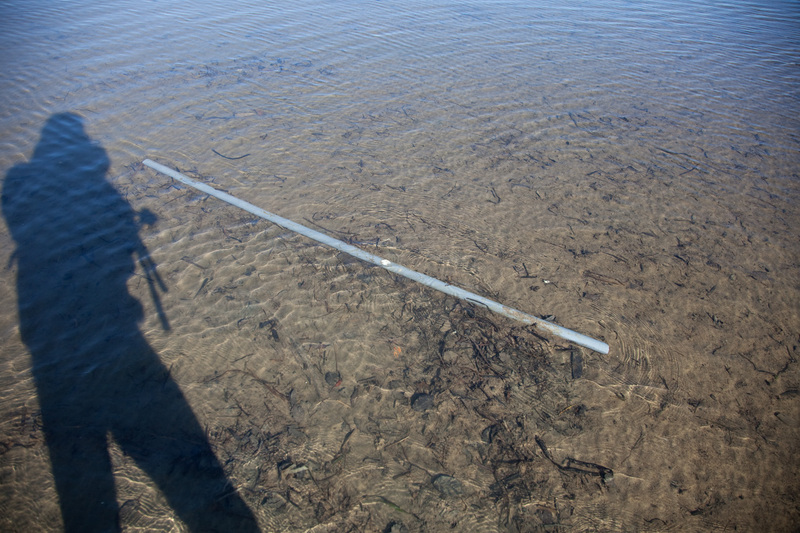 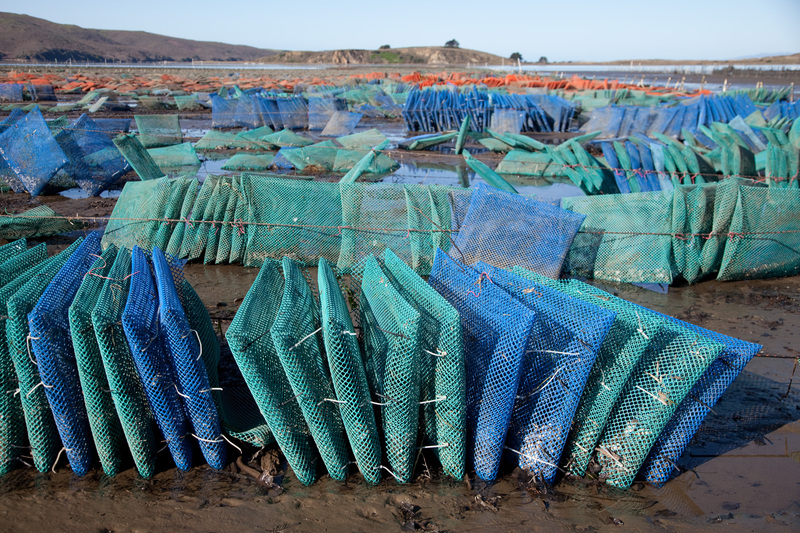 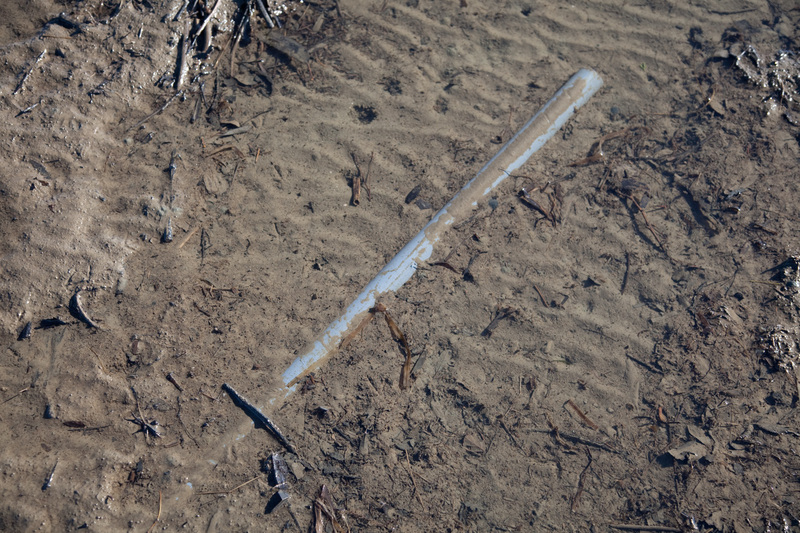 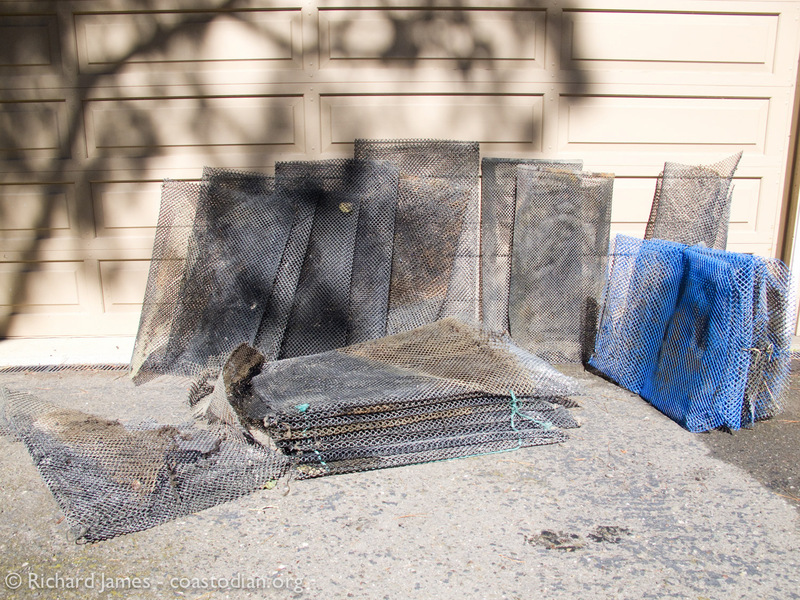 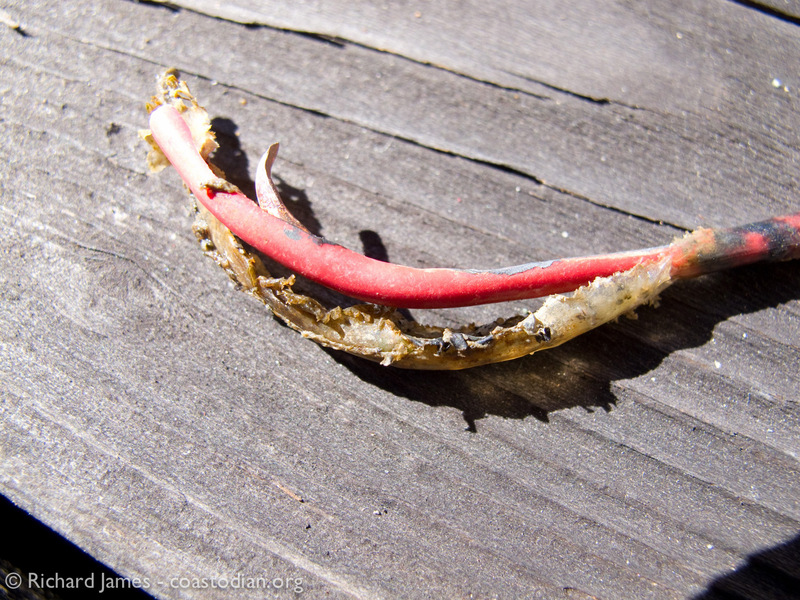 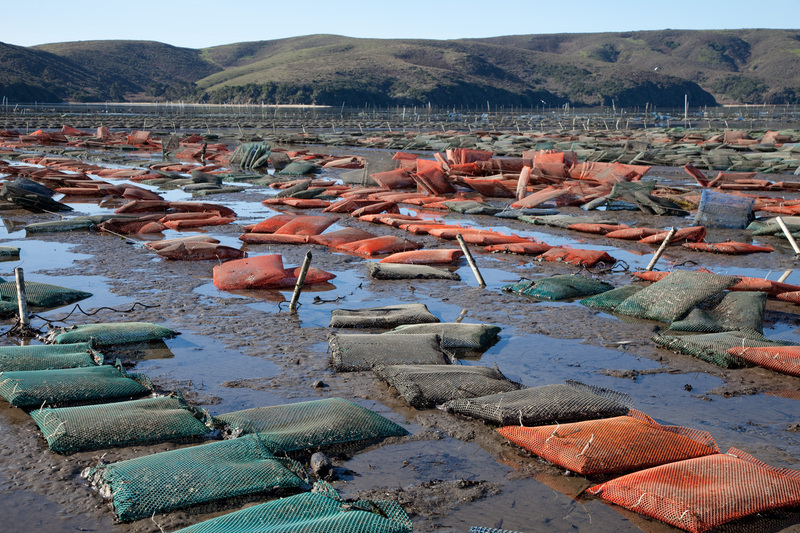 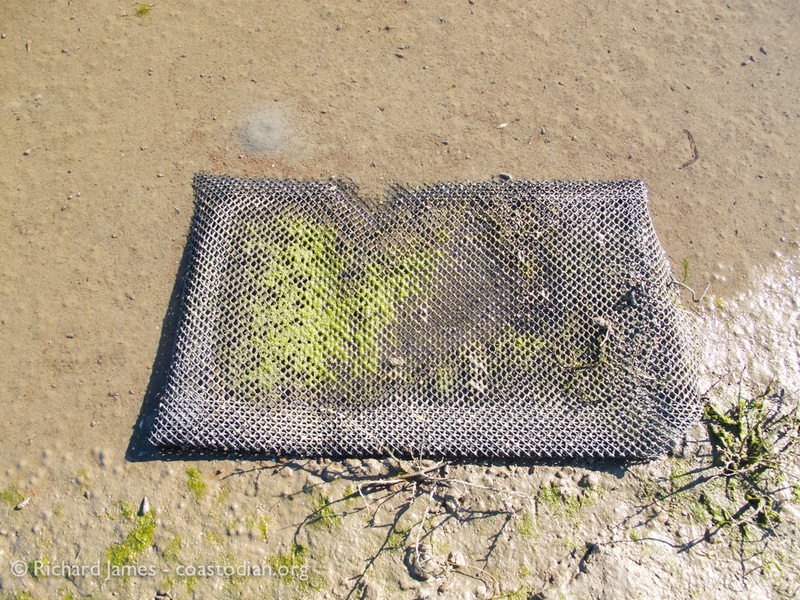 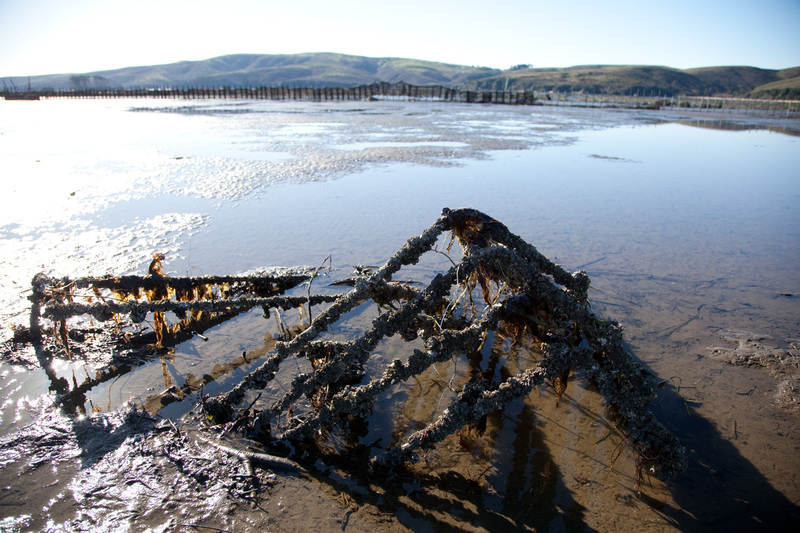 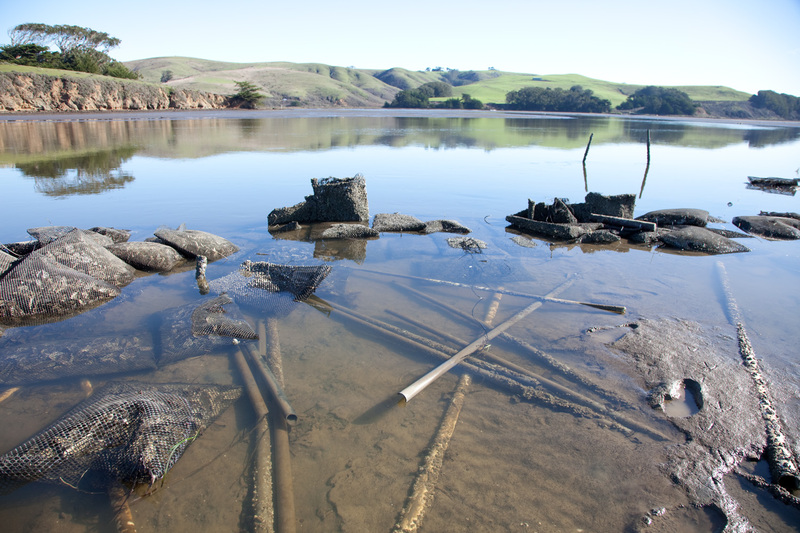 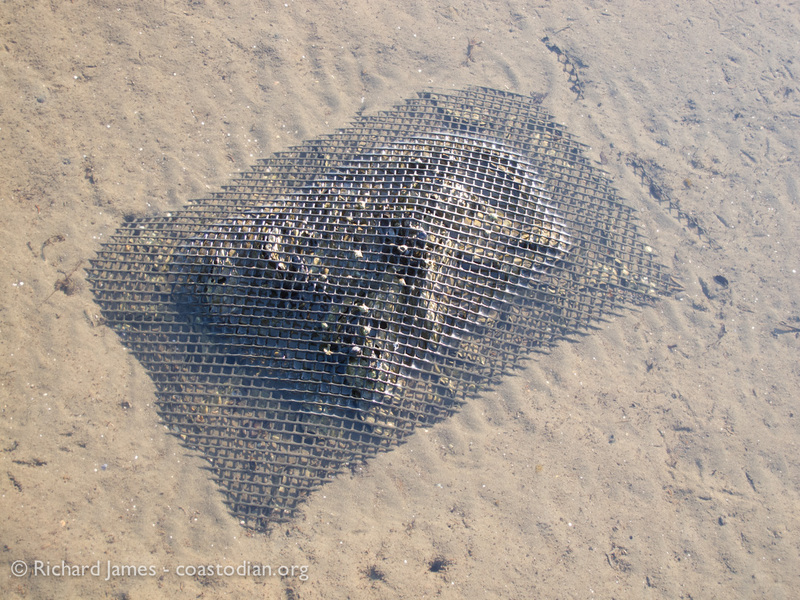 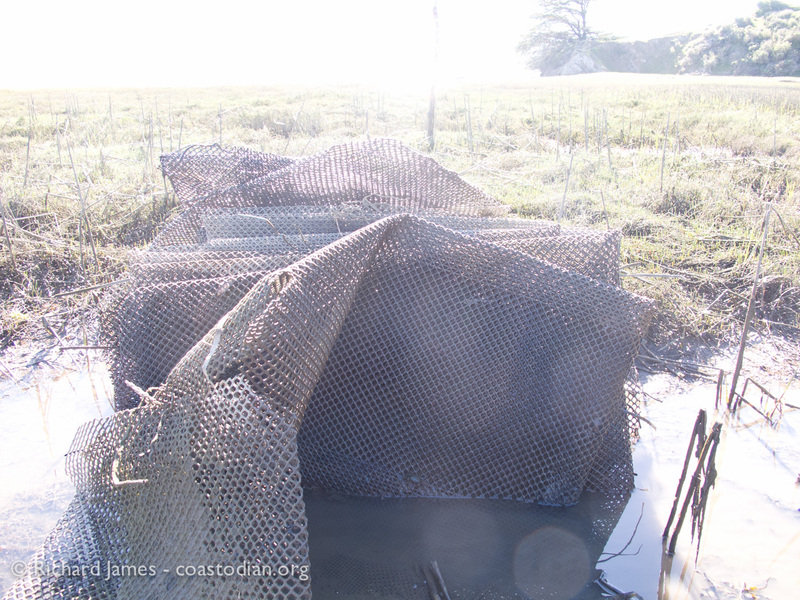 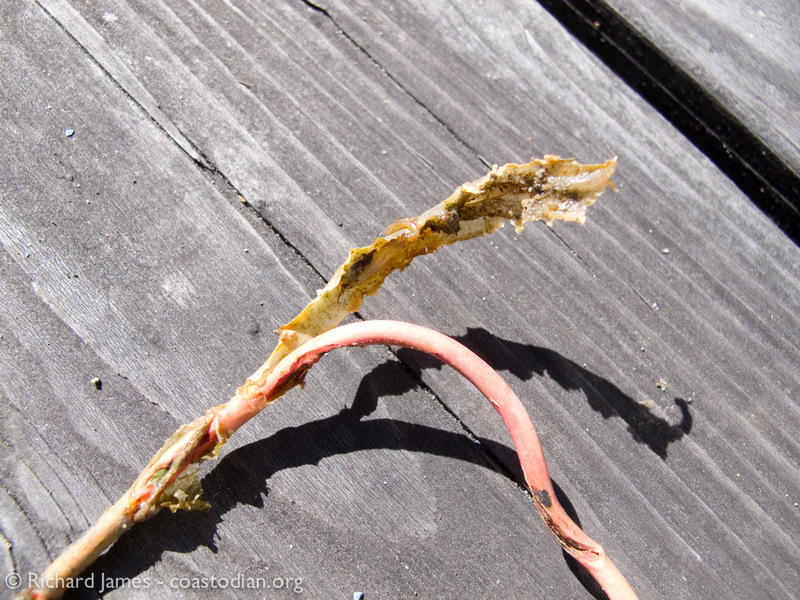 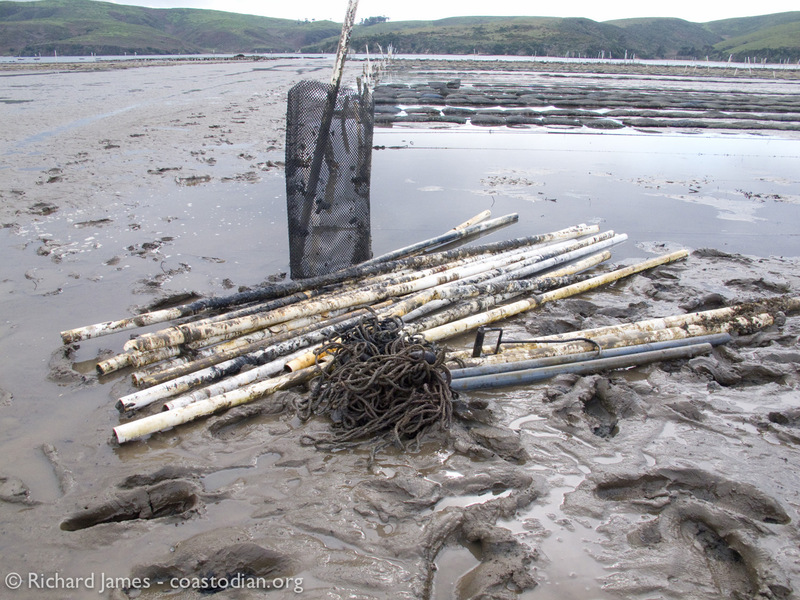 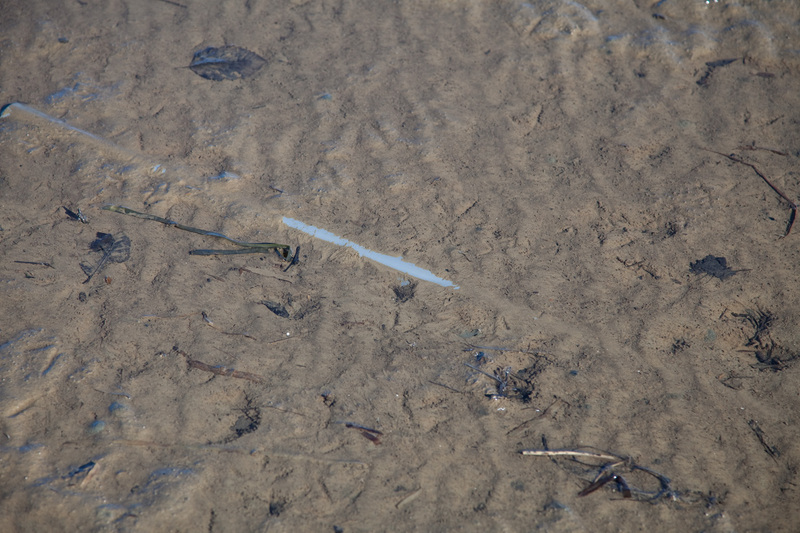 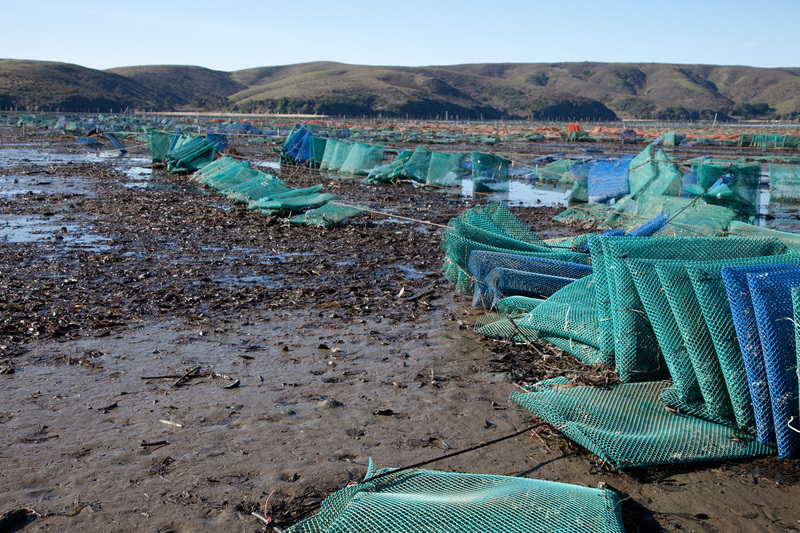 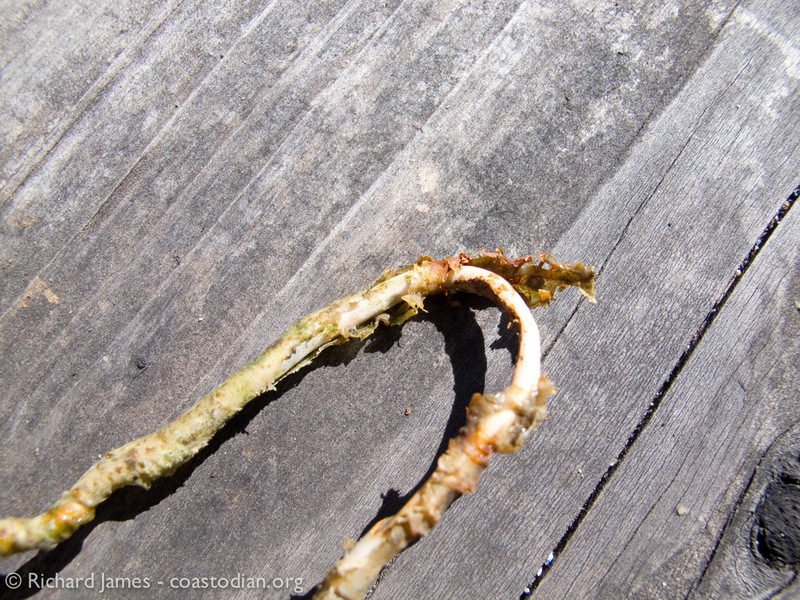 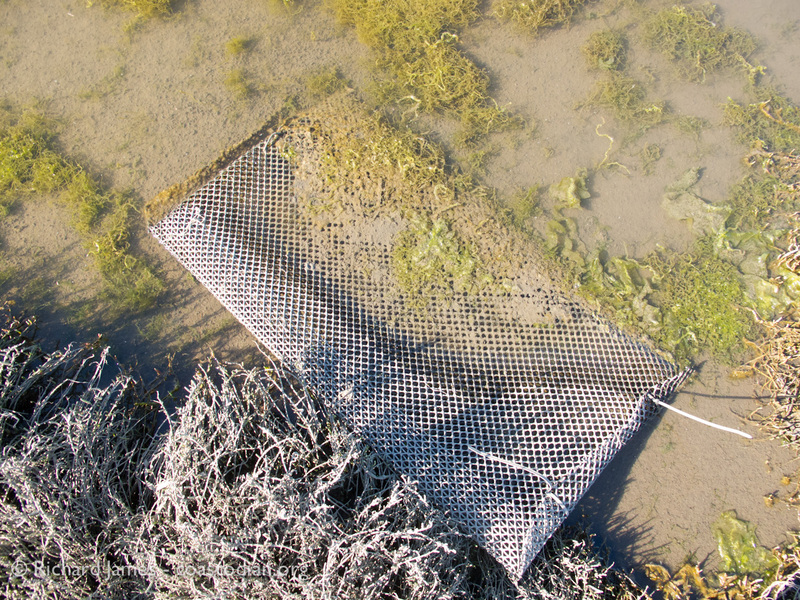 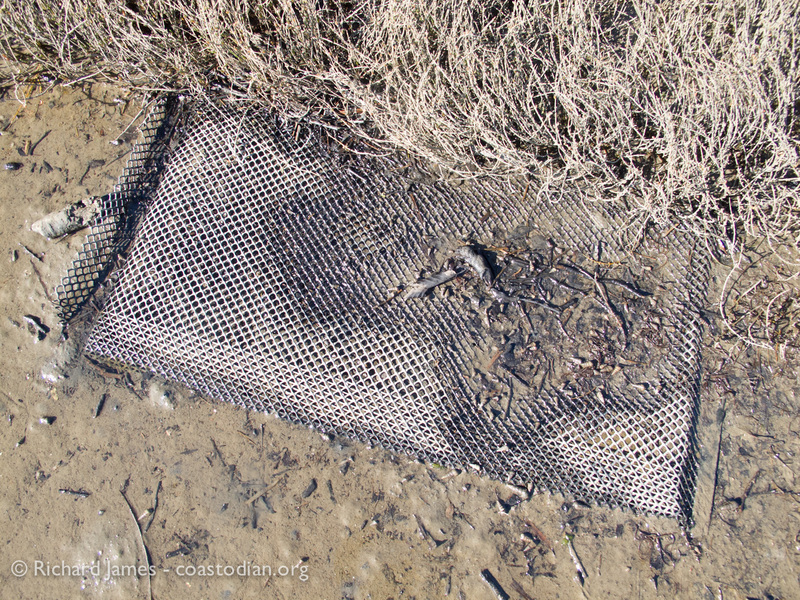 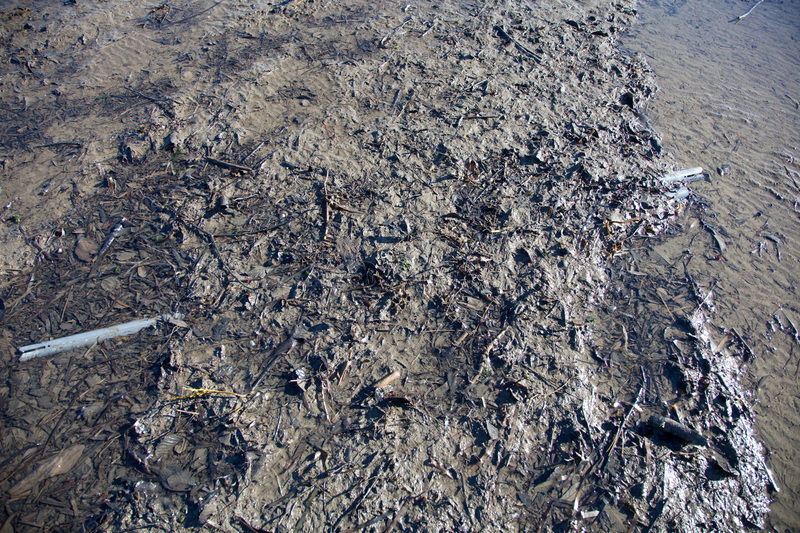 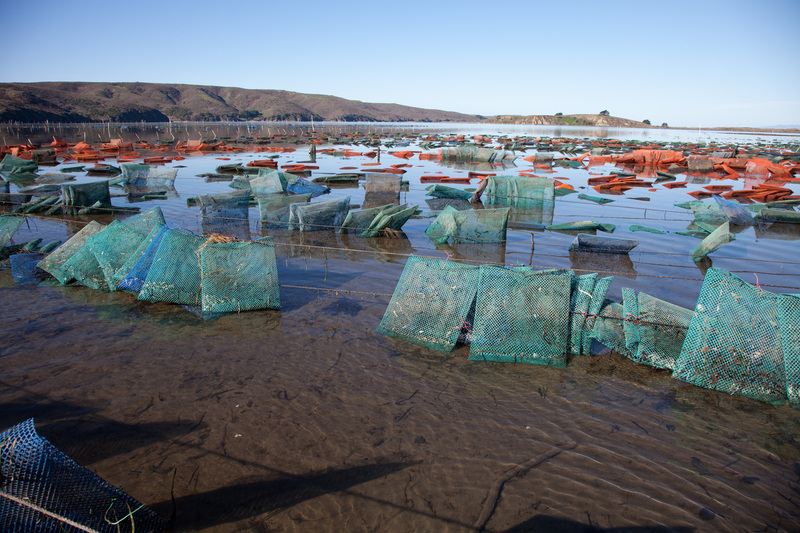 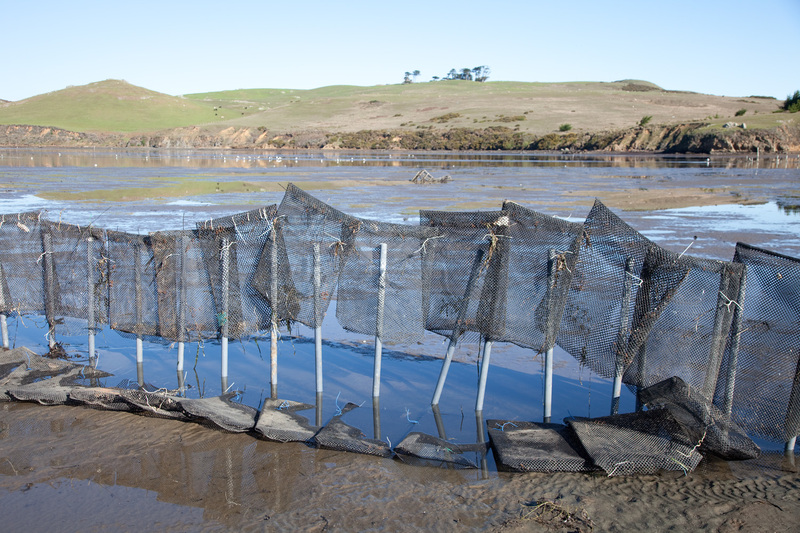 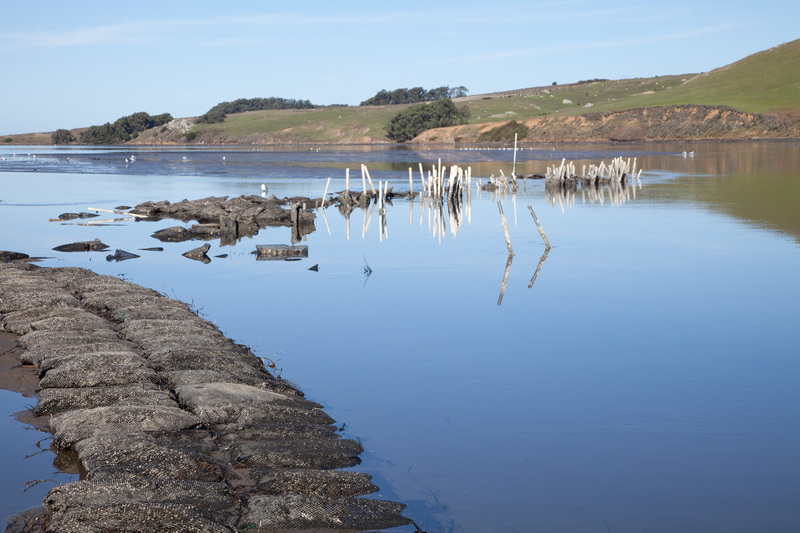 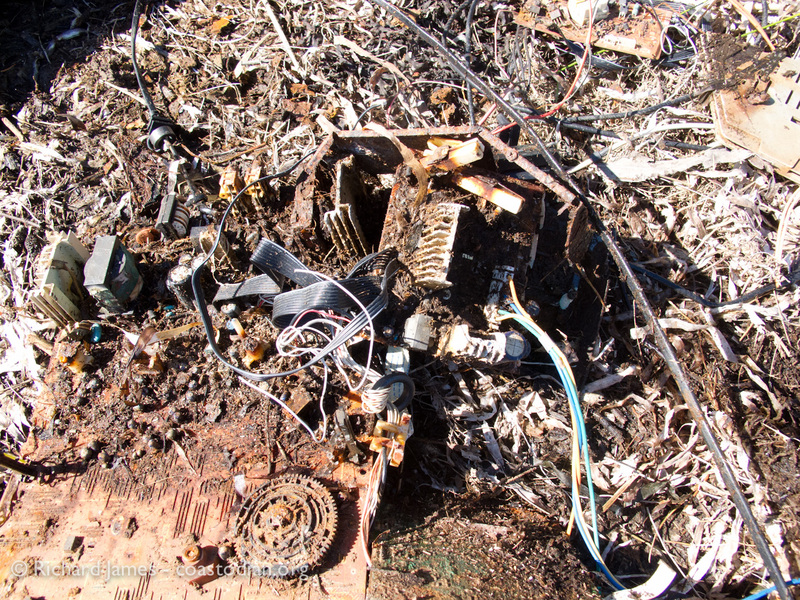 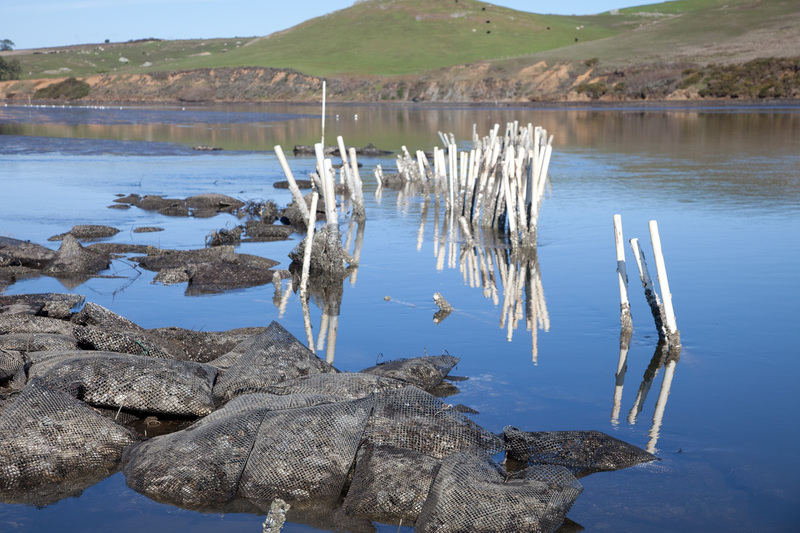 ©Richard James – coastodian.org – Yet another tool left in the Tomales Bay. 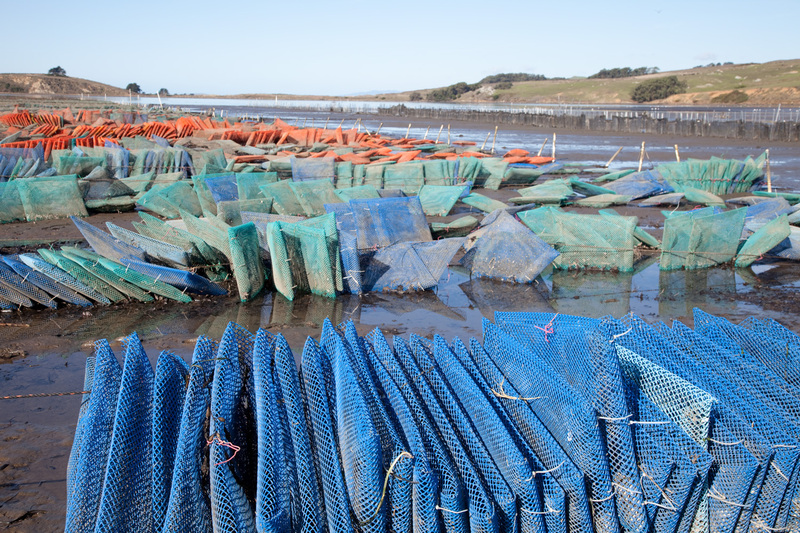 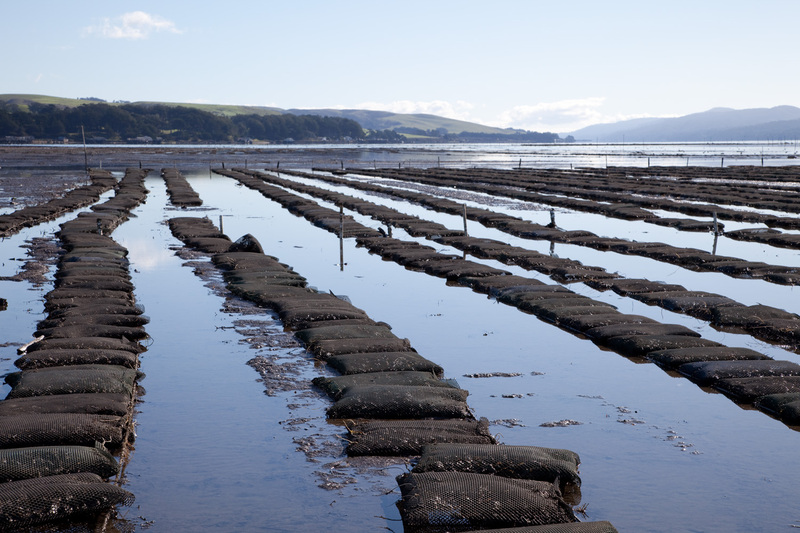 Oyster farming is very, very hard work, no doubt about that. 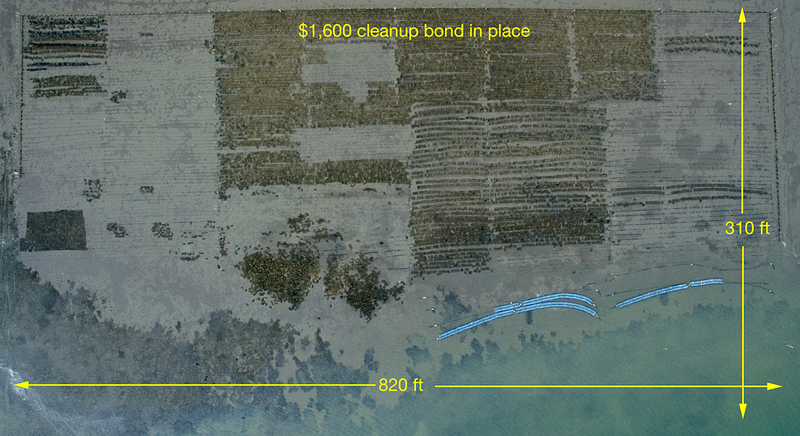 But if it cannot be done without leaving the sort of mess you see in the above images, perhaps the leases need to be reduced in size so that the existing crews CAN keep everyone’s environment looking much better. 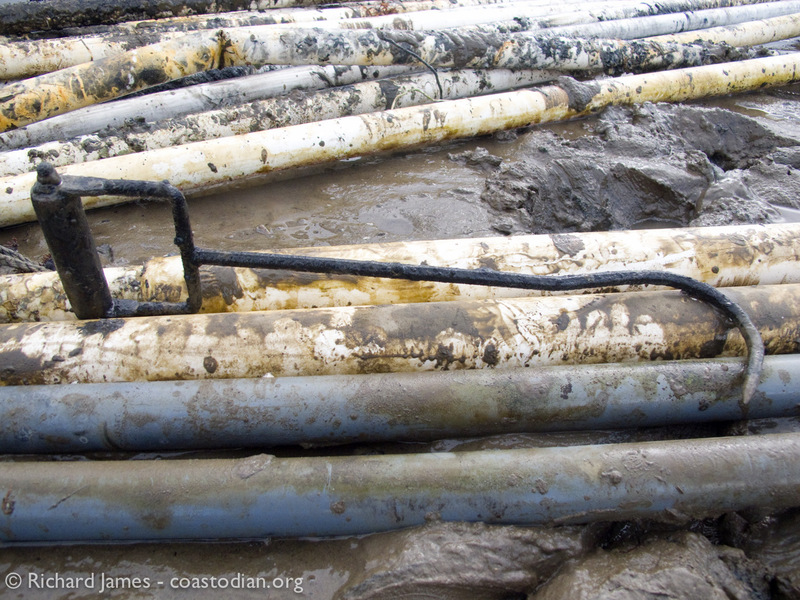 In addition, workers need to NOT leave their tools, gloves, bottled water etc. 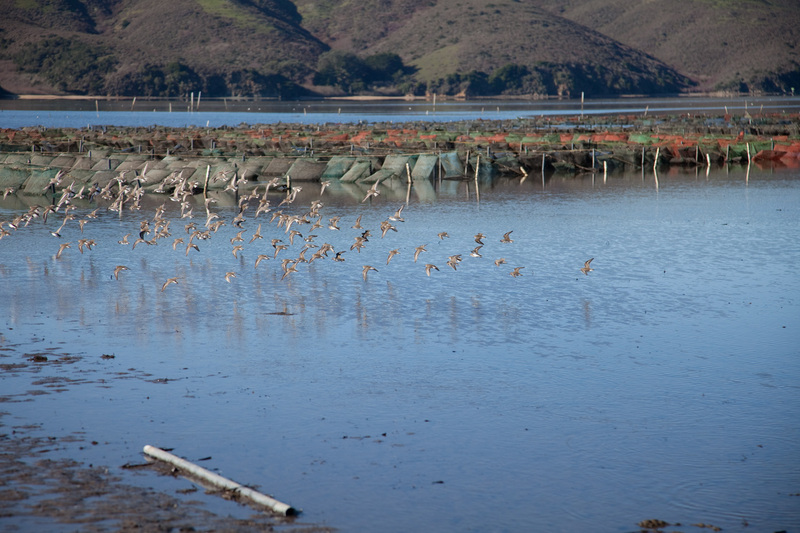 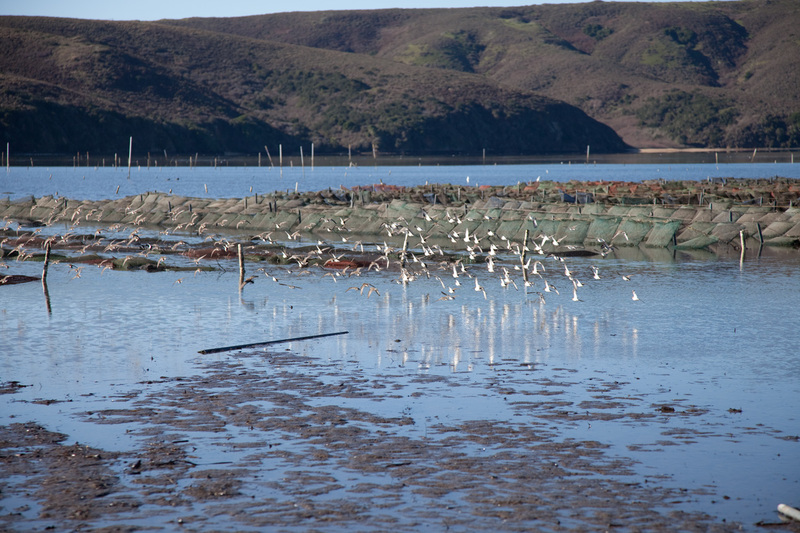 out on “their worksite”, AKA Tomales Bay, home to a multitude of birds, fish and insects. 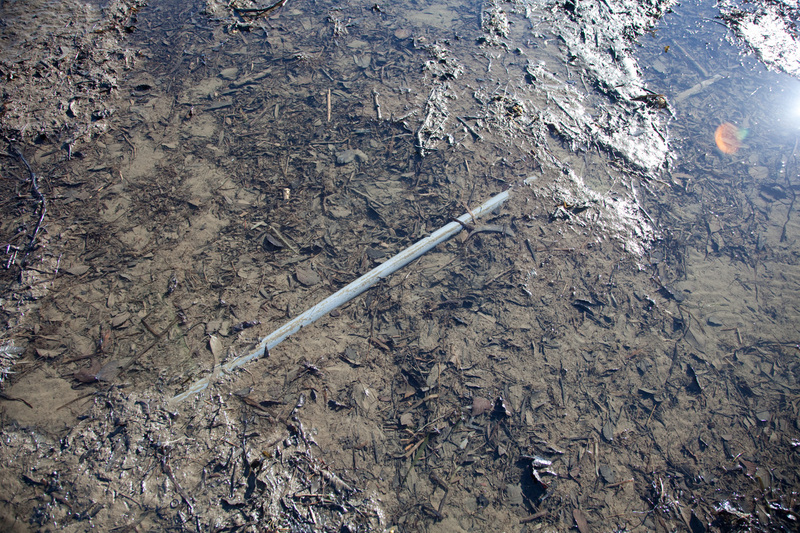 Next installment may be found here.